Neal Campbell--Words and Pictures. | Reviews, articles, essays, and photograhs having to do with organs and related topics of church architecture and liturgy. These sketches were published in the February 2016 issue of The Journal of the Association of Anglican Musicians. For almost three years prior to June 2016 my local colleagues and I worked regularly as we prepared to host the 50th anniversary conference of the AAM held in Westchester County, New York, and Fairfield County, Connecticut. For this reason the conference became known as the Fair-Chester Conference. One of my tasks was to prepare brief sketches on the conference venues and organs for the Journal, a very enjoyable job as there are many significant examples of each in the area, and part of the conference intent was to showcase the differing styles of architecture in which we worship and make music. Terry Byrd Eason was a featured conference personality as he took us through significant details at each venue. As preparations and schedules emerged it was with regret that the committee had to cancel plans to visit the churches in New Canaan and Mt. Kisco but I’ve included details here of these architecturally significant churches. Established in the early 1950s St. Barnabas was admitted to the Diocese of Connecticut as a parish church in 1967, and was designed by Greenwich architect Philip Ives. Richards, Fowkes & Co. installed its Opus 1, there in 1991. The original St. John’s Lutheran Church was formed in the mid-19th century by Swedish immigrants who moved into the area from Bridgeport. The present building, inspired by the New England meeting house style, was built in 1954. 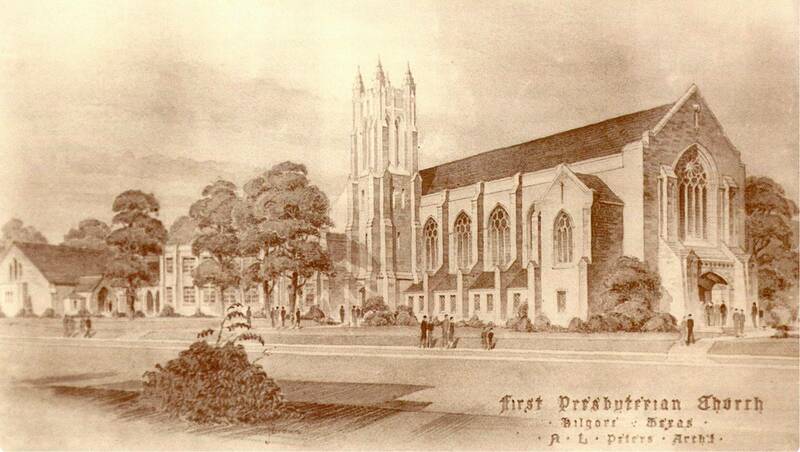 Known colloquially as the “Fish Church” because of its appearance in profile and floor plan, the First Presbyterian Church is generally considered to be one of the most significant ecclesiastical structures of the 20th Century. Designed by Wallace K. Harrison it was dedicated in 1958 and is unique in its combined use of precast concrete slabs together with thick faceted glass designed by Gabriel Loire of Chartres, France. The organ is Visser-Rowland’s Opus 87. The carillon in the tower was built by Gillett & Johnston in 1947 and amended by Paccard in 1968. The parish traces its history to the pre-Revolutionary War era and originally included what is now Greenwich, Stamford, Darien, and New Canaan, and is the mother church of Anglicans in Fairfield County. The present building, the third for the parish, was designed by noted Victorian Gothic architect William Potter who designed many churches in New York and academic buildings on the campus of Princeton University in the latter half of the 19th century. The new church was opened for worship in 1891 and originally contained a Roosevelt organ. In 1917 Skinner installed its Opus 277 and it served the church until the 1960s when a new McManus organ was installed in the gallery. In 1990 the church installed the present organ, essentially a new instrument incorporating selected pipework from the previous organs. In an unusual arrangement, the church functioned as general contractor for the new organ and farmed out work according to its specifications, all under the direction of Craig Ferguson, chairman of the organ committee and vestryman of the parish. Tonal work was facilitated by Bruce Schultz and mechanical, engineering, and structural design was completed by the Foley-Baker. In the late 1980s the church began plans to develop its property into an innovative design which came to be known as Canterbury Green, a mixed use complex consisting of apartments, retail stores, parking, pedestrian arcades, and a park-like garth surrounding the church, all of which was given the New York State Association of Architects Award in 1995. Canterbury Green rising around St. John’s Church. Established as a parish in 1749, the present church building was built in 1910 to a design by local architect William F. Dominick. The noted parish Choir of Men and Boys was established in 1934 and has since been joined by the Choir of Girls, a mixed adult choir, a training choir, and a Compline Choir. The church has recently undergone an extensive restoration. The large Austin organ was installed in 1976. From 1895-98 Henry Vaughan directed the work of building the present Christ Church specifically for the purposes and needs of Anglo-Catholic worship, and it is considered to be a masterpiece of his style of parish church architecture. With close ties to Yale University and the Institute of Sacred Music, the music of Christ Church attracted considerable attention under the leadership of our colleague Rob Lehman, and was among the first churches on college campuses to introduce Compline into its rota as an offering targeted to the student population. In addition to his position as Professor of Organ at Yale, Thomas Murray is the organist of the church. Lively-Fulcher installed a new organ in 2005. Trinity Church, one of three churches on the largest town green in New England, was designed in 1813 by Ithiel Town, who developed his version of “Gothick Style” some twenty or thirty years before what has come to be the accepted beginning of the Gothic Revival in America. Trinity maintains one of the oldest choirs of men and boys in America, having begun in 1885. The church has since established a parallel program for men and girls, and adults. Walden Moore recently observed his 30th anniversary as Organist and Choirmaster of the church, following in the lineage of Stephen Loher and G. Huntington Byles. The organ was built by Aeolian-Skinner in 1935 and is maintained by Joseph Dzeda of the Thompson-Allen Co., also curators of the organs at Yale University. Woolsey Hall is the principal auditorium on the campus of Yale University and is used for a variety of academic and community performances and events. It is part of the Bicentennial Building Complex built in 1901 which also includes the Memorial Rotunda and the University Commons. It was designed in the Beaux Arts style by the noted New York firm Carrière & Hastings and seats some 2,600 persons. In it is contained what is generally considered to be one of the great organs of America, if not the world: the Newberry Memorial Organ, the work of the Skinner Organ Company in 1928, incorporating pipework from two previous organs. Unique as the organ is, even more rare is the fact that so large an organ, now almost 90 years old, is maintained in perfect working condition under the care of the Thompson-Allen firm. Christ Church Bronxville is a parish in the Diocese of New York which has long expressed its worship life through music and liturgy in a “high church” tradition. Known for its local adaptation of Sarum traditions, the parish was the host for the first AAM American Sarum regional conference in 2010. Christ Church is the last parish church with which Bertram Grosvenor Goodhue was associated. It was Goodhue, together with his partner Ralph Adams Cram, who revolutionized the Gothic landscape of America in the first quarter of the 20th century. Goodhue supervised the siting and general plans but died before the church was completed. The organs in Christ Church have been represented by some significant American builders. During the extraordinary 45-year tenue of Robert Owen the Aeolian-Skinner and Gress-Miles organs became well known through his concerts and recordings. As the vicissitudes of wear and tear took its toll, the organ was ultimately replaced after a long series of modifications and repairs by a new organ built by Casavant in 2010. A service in the mid-1950s . . .
. . . and a recent celebration, Christ Church, Bronxville. One of Westchester’s unique jewels, Glen Island was originally created in 1879 as a summer resort for a business representative named John H. Starin. In 1923, Glen Island Park and Casino was acquired by Westchester County. The Glen Island Casino was a springboard to success for several noted bands during the 1930’s Big Band Era, including those of Ozzie Nelson, Charlie Barnet, Claude Thornhill, Les Brown and the Dorsey Brothers. In March of 1939, Glenn Miller and his orchestra got their big break when they were chosen to play a summer season at the prestigious Glen Island Casino. The casino was closed in 1978, but reopened in December 1983. The original shell of the building and the dance floor in the second-floor ballroom, where the bands played, were retained. The club is now a premier event facility with stunning water views and award-winning cuisine and hospitality. Anglicans have worshiped in New Canaan since pre-Revolutionary War times; the original St. Mark’s is now St. Michael’s Lutheran Church in the center of town on God’s Acre, the original portion of the village set apart for its houses of worship. The present church, opened for worship in 1961, was designed by Stamford architect Willis N. Mills and draws its inspiration from Medieval principles applied to mid-twentieth century styles and techniques. The rood screen iconography is the work of Clark B. Fitz-Gerald and features sculptures of wood and metal. St Mark’s takes its place among the other ecclesiastical and domestic designs in New Canaan that make the town a showplace for the American modern architectural movement of the 1950s, inspired by the European Bauhaus developed by Walter Gropius and Marcel Breuer and their students, among whom Philip Johnson was the best known. Austin installed a new organ when the present church was built and has recently made some additions and modifications. The carillon in the tower is by Paccard. At Mount Kisco, we have almost completed the best . . . church I have so far done; and though the tower isn’t on, the various details have been so carefully carried out and the atmosphere is so much that of an English church of the “right” period, that it would give you a better idea of my dreams and my gods (architecturally speaking) than anything else. Among the details Goodhue oversaw was commissioning Hildreth Meiere to paint the altar triptych, her first professional work. The present organ was built by Aeolian-Skinner as its Opus 1201 in 1951, and was designed by G. Donald Harrison, who placed his signature plate on the console. The organ became widely known via a recording by long-time organist Edgar Hilliar on the Aeolian-Skinner “King of Instruments” series of recordings. St. Mark’s, Mt. Kisco. The Positiv organ is suspended from the ceiling at the entrance to the chapel across the chancel from the main organ. On Friday following the conference proper an optional tour visited these four outstanding venues in New York City. The Church of the Intercession, at Broadway and 155th Street, once a chapel of the Parish of Trinity Church, is located in the midst of Trinity Cemetery where several notable New Yorker’s are buried, including Clement Clarke Moore, long-assumed to be the author of A Visit from St. Nicholas (’Twas the night before Christmas). Each year in December there is a procession to his grave and a candlelight reading of the famous story. Former New York mayor Edward I. Koch, himself Jewish, requested to be buried there, and he is. From an architectural standpoint the church and parish buildings are the most complete ecclesiastical work of architect Bertram Grosvenor Goodhue. It was Goodhue’s favorite of his church buildings and he is buried near the font in the north transept in a tomb given by his architectural colleagues, containing reliefs of some of his famous buildings as rendered by sculptor Lee Lawrie. Pictures of the organ case designed by Goodhue found their way into several books in the 20th century. Its use of en chamade pipework is probably the first instance of that in America, although the pipes themselves are non-speaking. Goodhue traveled to Mexico and it is thought that he was inspired by organ cases there containing reed pipes en chamade. The first organ in the church was built by Austin. The present organ is comprised of the Aeolian-Skinner organ formerly in St Paul’s Chapel of Trinity Parish, installed by Schlicker with additional new pipework and console. Case of the original organ designed by Goodhue. The Cathedral Church of Saint John the Divine is the largest Gothic church in the world and is the seat of the Bishop of the Diocese of New York. Following a competition which saw submissions from several architects in a wide variety of styles, construction began in 1892 to a design by Heins & LaFarge, who submitted the winning entry in the Byzantine-Romanesque style. When Heins died in 1907 the first phase of construction ended with the apse and choir complete. A “temporary” dome, still in place, was built by the Guastavino firm and Ralph Adams Cram was called to complete the cathedral in the Gothic style. Although Cram’s entire design has never been completed, the length of the nave was opened in 1941, a length of 601 feet. The original organ was built by a young Ernest Skinner in 1906 as his Opus 150. It was extensively renovated with much new pipework by Aeolian-Skinner in 1951 to a design of G. Donald Harrison, including the famous State Trumpet at the west end. The organ was restored by Quimby and Douglass Hunt in 2008 following heavy smoke damage from a fire in the gift shop in the unfinished north transept. St. James Church at Madison Avenue and 71st street on Manhattan’s Upper East Side is an unusual amalgamation of styles. Began in 1884 to a Romanesque design by R. H. Robertson, it placed the altar at the west end of the church, at the Madison Avenue side so that no new construction would block the sunlight on the apse windows surrounding the altar. The main entrance to the church was mid-block on Madison Avenue. In the 1920s as the high Gothic style of ecclesiastical architecture was gaining favor throughout the country, and in New York in particular, the vestry of St. James engaged Ralph Adams Cram who essentially designed a new church using the existing structure as the footprint of the design to save money. A new chancel and elaborate altar reredos was created at the east end of the church, and a new entrance and tower was created opening on to Madison Avenue. This work was completed in time for services on Christmas Eve 1924. There have been previous organs by Austin and Möller, and the present organ by Schoenstein contains complete chancel and gallery divisions. The chancel of St. James Church, showing the organ facade and the reredos designed by Ralph Adams Cram. Grace Church at Broadway and 10th Street was founded in 1805 in lower Manhattan just a few blocks from where several Episcopal churches were located, near where Trinity Church stands today. The present church was completed in 1846 and is the work of James Renwick, Jr., who was 24 years old at the time. Although his later design for St. Patrick’s Cathedral is better known, Grace Church is considered his masterpiece. The site on which the church stands was originally the farm of Henry Brevoort and legend has it that as the town fathers were extending Broadway north onto his farm, he stood guard with an ax threatening anyone attempting to build a road through his property. It is for this reason that Broadway takes an abrupt turn westward at this very point in its progress uptown. And as a result, Grace Church is the focal point of a commanding view appearing at the head of Broadway from over a mile downtown. Grace Church has had a succession of fine organs and organists. The church for many years maintained a choir school, the first in the city (now a parish day school from which choristers are drawn), founded by James Morris Helfenstein. The choir and school flourished under the direction of Ernest Mitchell who was an “organist’s organist” in the early-mid 20th century. Both Tournemire and Vierne dedicated compositions to him, and many organists “of a certain age” will remember the picture of Mitchell at the imposing console of the 1928 Skinner organ which appeared in the World Book Encyclopedia in the 1950s and 60s. The console is now on display in the music office of the church. The present organ by Taylor & Boody dates from 2013 and has been lauded as a tonal and engineering masterpiece. An antique card picturing Grace Church in the 1920s. 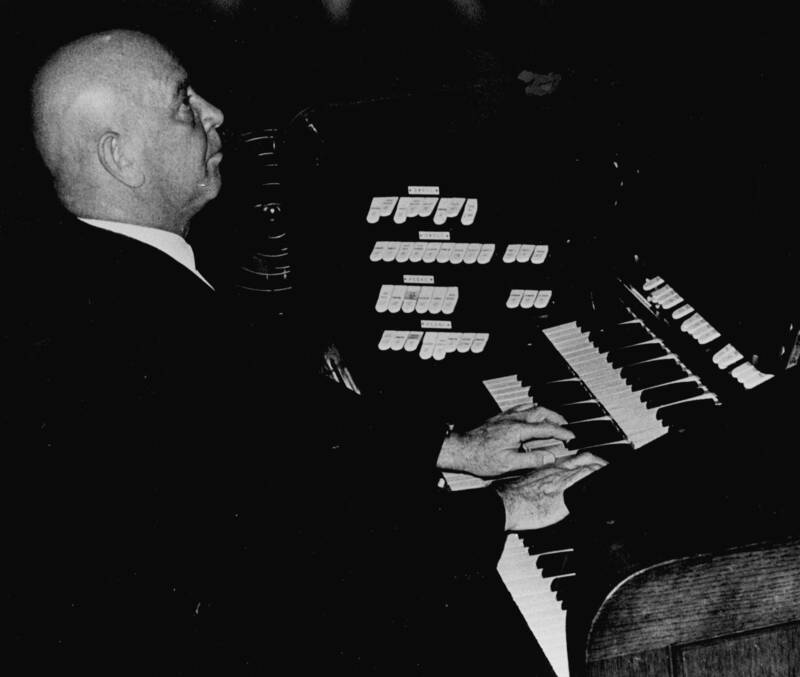 Ernest Mitchell at the console of Skinner Opus 707, a photo which appeared in several editions of the World Book Encyclopedia in the 1950s and 1960s. The Taylor & Boody organ. Philip Moore at the garden party at Christ Church Greenwich. Conference committe chairman Geoff Smith, John Boody, Suzanne MacDonald, and Judith Hancock at the garden party on the grounds of Christ Church Greenwich. Philip Stopford, Christopher Wells, Anne Timpane, and Geoff Smith, present and past organists of Christ Church, Bronxville. Fr. Carl Turner in the pulpit at St. John’s in Stamford. Bp. Keith Whitmore, with Rob Lehman and Sonya Sutton at the Glen Island Harbour Club. Nick Andrews, Terry Eason, and Doug Hunt on the steps of St. John the Divine. Barry Rose and Murray Sommerville at Grace Church, NYC. John Boody at the tomb of Bertram Grosvenor Goodhue, Church of the Intercession, NYC. A memorable week draws to a close. This article was commissioned by Emery Brothers and appeared in the December 2017 issue of The Diapason. June 26, 2014 Boston, Mass. Thomas Richner was not part of the “organ scene” of Boston musical life in the way that—say—George Faxon or Francis Snow were. Indeed, he never maintained a permanent residence in Boston, but rather commuted from his home on Long Island or his apartment in New Brunswick for his duties in Boston, where he had an apartment in the Prudential Center. But from 1971-1993 he was the organist of The First Church of Christ, Scientist, The Mother Church, in Boston and in that capacity he was one of the most visible and best-known of Boston organists, and—indeed—of American organists in general. c) the organ was already famous as the largest Aeolian-Skinner ever built. Born November 4, 1911 in Point Marion, PA, “where the Cheat River and the Monongahila River come together—that’s the point!” as Uncle T would say. And, lest you think I’m being overly familiar in referring to Dr. Richner as Uncle T—believe me—to anyone who was in his presence for more than ten or fifteen minutes, Thomas Benjamin Richner was Uncle T at his own insistence. There was not a lot of musical incentive growing up, but he did develop an early interest from local musicians and he eventually earned the B.Mus. degree from West Virginia University. He found his way to New York to study with Dora Zaslavsky who, together with her husband—the famous painter John Koch, quickly became family to him. Later, he even lived across the street from them in Setauket, a lovely village on the north shore of Long Island, when they told him of a bungalow that was for sale. Uncle T was even represented in one of Koch’s paintings. It was Koch’s custom to use friends and colleagues as subjects in the paintings of his and Dora’s life together in New York. “Summer Party” by John Koch. Tom Richner is depicted looking out the window next to the woman gesturing outside. Tom won the Naumburg Award in 1940, sharing the prize with pianist Abbey Simon, and violinist Harry Cykman—and his significant performing career was launched, including a debut recital in New York at Town Hall for which the reviewer in the New York Times declared that he was a “born Mozart player,” an appellation that stuck for life. He earned masters and doctors degrees from Columbia University, where his dissertation titled Orientation for Interpreting Mozart’s Piano Sonatas was turned into a standard reference book of the era. He taught at Teachers College from 1946-68, and at Rutgers University from 1959-86. During his early years in New York he converted to Christian Science, and for the rest of his life he remained a devoted follower, but he was never ridged, doctrinaire, or proselytizing about it. It was just a natural part of his life. In the 1950s Tom became the organist of the Fifth Church of Christ, Scientist, in New York, an influential branch church which inhabits the lower floors of a mid-town office building near Grand Central Terminal which had an old Skinner organ. It was rebuilt by Aeolian-Skinner in 1955 when he and G. Donald Harrison set about turning it into a deluxe instrument for playing services, as well as for repertoire, including double antiphonal expressive divisions which T used to great effect in the “tapers” at the conclusion of the hymns and other passive portions of the service. While retaining all of the solo and color stops of the old organ, it exhibits all of the classic hallmarks of Harrison’s post WW II organs—cohesive independent choruses on all manuals, and fully developed Positiv and Pedal divisions. It is truly a great organ desperately in need of restoration or relocation. All of which brings up T’s organ playing and study. He was essentially self-taught. But he regularly went to the Sunday afternoon services at St. Bartholomew’s Church played by the legendary David McK. Williams, and T emulated much of Williams’ style in accompanying and service playing. I don’t think it is an overstatement to say that DMcKW’s playing had the single most influential effect on T’s own organ playing. T talked about David and his playing until the end of his life—almost with tears in his eyes. He said it was that beautiful and he was that moved. Tom later received the honorary D.Mus. from Colby College, where he directed the Richner-Strong Institute in the summers, and the honorary D.H.L. from Greenwood College in South Carolina. After his retirement from The Mother Church and Colby, he was Artist-in-Residence at Rollins College. He died at his home in Worcester on July 11, 2008—at age 96. Since this is a gathering of organists, I titled this talk with T’s role as organist first. I really think that he could have had a significant career in any of these categories, but the realities of life are such that one aspect of one’s abilities usually eclipses others, even if the gifts are distributed evenly. 2. Organist, both at the two cardinal Christian Science churches mentioned, and as a touring concert organist. And only as a distant third . . .
3. . . . is he remembered as a Composer. But I do feel that in his small body of work he found a unique compositional voice that—had he devoted more time to it—would have yielded a style that was both approachable and lyrical, but also a challenging synthesis of expression within the mid-century school of American composition. 4. Two Recordings of Solos for use in the Christian Science service. Each were recorded, as was T’s custom, at regular Saturday rehearsals prior to Sunday services. The soloist is Esperanza Isman, who had a significant singing career. She later converted to Christian Science, eventually becoming a practicioner. The following article appeared in the January 2016 issue of The Journal of the Association of Anglican Musicians. Though open for instruction for slightly less than a decade beginning in 1962, the College of Church Musicians on the close of Washington National Cathedral exerted an influence of national proportions that belied both the small size of its student body and the short span of its existence. The former is entirely in keeping with the original vision of the college which began shortly after the Very Rev. Francis Bowes Sayre, Jr., dean from 1951 to 1978, assumed leadership of the cathedral. The latter, sadly, was the result of the confluence of several vicissitudes that afflicted the Cathedral throughout the 1960s. From the outset of his leadership, Dean Sayre pursued a vision that the Cathedral should play a significant, vital role at the intersection of the nation’s political and spiritual life. He also came to the Cathedral at a critical juncture in its architectural design and construction, and he was the de facto iconographer as decisions unfolded regarding the artistic fabric of the cathedral. His towering infectious spirit imbued itself in all of his undertakings as he sought to make the fledgling cathedral a temple landmarked for the interdependent disciplines of Christian worship, and the performance and study of sacred music in the context of the liturgy. Provide a center in the United States to stimulate, guide, and encourage creative and experimental work in church music. In fact, by the time the College closed, it also offered studies in Jewish music and established an endowed chair for that purpose, held by Herman Berlinski and funded from a grant in memory of Rabbi Norman Gerstenfeld, the Senior Rabbi of nearby Washington Hebrew Congregation, the largest Reform Congregation in Washington where Berlinski was organist. Rabbi Gerstenfeld died in 1968 and his son had attended St. Alban’s School. The first class of fellows consisted of Charles Bradley, New York; John Cooper, California; David Koehring, Indiana; Roger Petrich, North Dakota; William (Pat) Partridge, Virginia; Ronald Rice, Ohio; and Beverly Ward, South Carolina. Leo Sowerby with the first class of fellows. L-R Ward (standing), Bradley, Cooper, Rice, Partridge, and Petrich. David Koehring is missing from the photo. These seven fellows represented Episcopal, Baptist, Lutheran, and Presbyterian denominations. In the ensuing years several students matriculated following the graduation of this founding class. Some of their names are very familiar to 21st century AAM members, and others less so; sadly, several are now deceased. The college may have been ecumenical in its philosophy and student body representation, but there is no doubt that the prevailing ethos leaned heavily toward the Episcopal way of doing things, and following graduation most of the fellows pursued careers at what were once known as cardinal parish and cathedral churches throughout the United States. Shortly after the school’s opening Sowerby and Callaway were the “kingmakers” of choice as they fielded calls from rectors and deans throughout the country seeking church musicians to fill their vacancies. After graduation and positions in South Carolina and Baltimore, Pat Partridge is still the canon musician, organist and choirmaster of Christ Church Cathedral in St. Louis, a position he has held since 1981. The Rev. William G. Workman, canon precentor of the cathedral. As the decade progressed other noted Washington musicians were added to the faculty, including John Fenstermaker and Ronald Stalford (themselves graduates of the CCM), Richard Roeckelein, Albert Russell and a young John Corigliano who taught composition after Sowerby died. Students for the college were recruited largely through what could, at that time, rightfully be called the old boy network—recommendations and word-of-mouth endorsements easily found willing applicants. From the aspiring students’ standpoint enrollment was a slightly tricky proposition. So specialized was its mission and so small the student body that typical administrative details expected of a college pertaining to finances and accreditation were never finalized in the normal, legal sort of way, although from the outset it was determined that students would pay no tuition. And the cathedral foundation’s charter did give it the right to confer degrees. It is a tribute to the reputations of the founding faculty, especially Sowerby, that so rich a field of applicants was gathered. Some students already had graduate degrees, or transferred from (or later to) nearby degree granting institutions, such as American University and the Catholic University of America, each of whom allowed fellows to take courses and to use their libraries. And in a rare case or two a fellow was admitted without an undergraduate degree. It was a very customized approach to higher education befitting the specialized nature and purpose of the college. 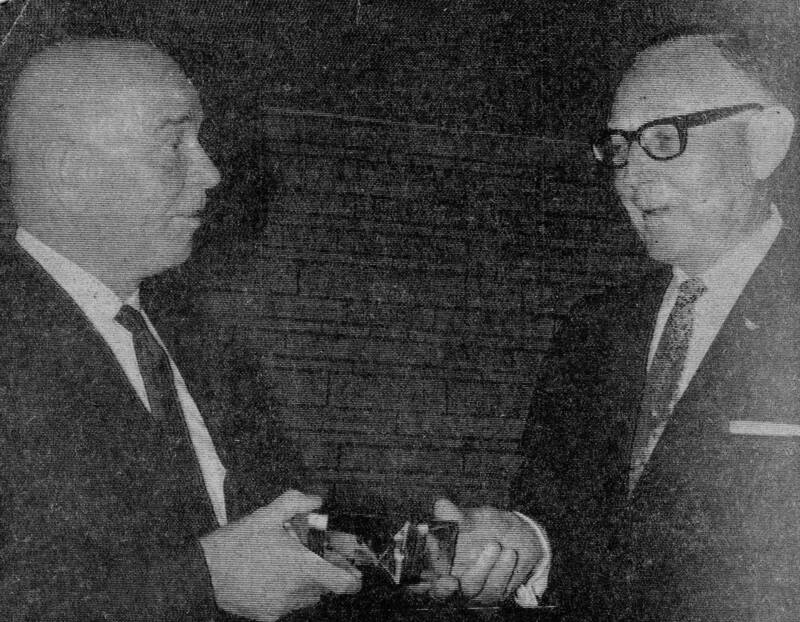 Dr. Sowerby with John Fenstermaker, 1965. There were other prominent institutions of higher learning in this country which very effectively trained aspiring students at the graduate level for careers in sacred music. Notable among them was the School of Sacred Music at Union Theological Seminary in New York. Its director, Robert Baker, was on the governing board of the CCM and he played an important advisory role in its life, particularly so as the college faced closure. Students at the College of Church Musicians were expected to have their own church jobs on Sunday mornings and their field work was supervised, as was also the case with those at Union Seminary. In the case of CCM, Dr. Sowerby would pay a scheduled visit to hear a student play and conduct a service on their home turf, and would offer written and verbal comments at a subsequent lesson. The main difference, practically speaking, between the CCM and these other schools was the master-apprentice system which, because of the small student body, was easily facilitated, and was an objective at the outset. Most of the student’s work was undertaken on a one-to-one basis. That, plus the fellows’ direct participation in the musical life of the Cathedral and its related schools, marked a definite distinction from what was offered elsewhere in sacred music studies. Richard Dirksen, Leo Sowerby, and Gerald Knight at the dedication of the Gloria in Excelsis Tower, Ascension Day 1964. 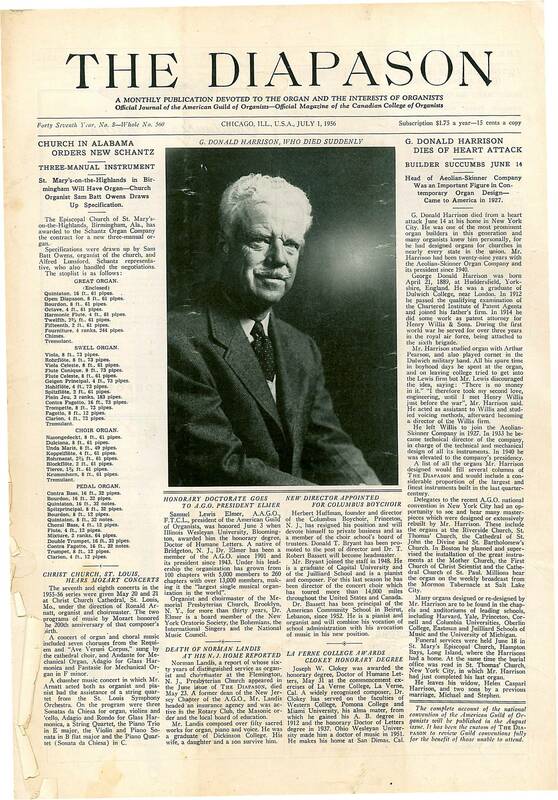 In the fall of 1962, Leo Sowerby told T. Scott Buhrman, who was preparing an article which appeared in the January 1963 issue of The American Organist, about the new college, saying that “we have classes now only to find out what the fellows don’t know and work from there. By February they should be completely on their own, not unlike the students at the Academy in Rome,” referring to his own time as a fellow of the American Academy of Rome. Sowerby guided the entire focus of the college and taught theoretical courses in analysis, counterpoint, orchestration, and composition, filtered through the lens of the requirements of the church musician. Students who were particularly gifted in composition occasionally found their works on the music list at cathedral services, and several found publication, particularly music for the new rites of the Episcopal Church which began to emerge in the era prior to the revision of the 1928 Book of Common Prayer and the various trial use liturgies which the cathedral undertook. Roger Petrich’s Variations on “Herzliebster Jesu” was written while he was a student of Sowerby prior to his admission to the CCM, but it was sung by the cathedral choir on a Good Friday service, recorded, later published by Oxford University Press, and is still in print, some fifty years later. All students were expected to have a mastery of compositional techniques such as to be able to write a descant, or an effective reharmonization, or to orchestrate hymns and anthem accompaniments for other instruments as needed. And students were encouraged to study for and to take the examinations of the American Guild of Organists. All students studied organ at an advanced level and played regular recitals on the cathedral’s Sunday afternoon series. Most students studied organ with Callaway, who also taught the choral conducting component of the curriculum, the repertoire for which usually consisted of whatever the Cathedral Choral Society was rehearsing at the time. The typical operating procedure for the study of this topic consisted of the student’s conducting a portion of a work with Callaway at the piano, playing precisely what the student conducted, exaggerating the mistakes! 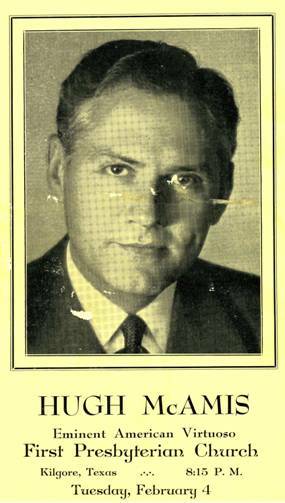 Music history courses were taught by Leonard Ellinwood, and liturgical topics by Canon Workman. Dr. Callaway and Ronald Rice at the cathedral organ. There were more than 20 services per week in the cathedral which to one degree or another required music, and the college fellows, in this regard, became adjunct assisting musicians fulfilling ancillary roles in the cathedral music program. The cathedral’s Sunday rota included, in addition to the 11:00 service (which in those days consisted of Holy Communion on the first Sunday of the month, and Morning Prayer and Sermon on the remaining weeks) an early service in the Bethlehem Chapel for which the junior choir sang, a 10:00 folk mass in an undercroft chapel, and Evensong at 4:00, followed by an organ recital. In addition to guest recitalists from around the country and around the world, the cathedral organists and the fellows took their turn in playing these recitals at which the entire gamut of the organ repertoire was offered, including hefty doses of contemporary music, such as then avant-garde works of Ligeti, the latest works of Messiaen, and occasionally a new work of Sowerby, who was almost always on hand, along with organ enthusiasts from all over the city. Growing up in Washington there were two places where you could always count on seeing someone you knew to visit and trade stories—Dale Music Company in Silver Spring on any given work day, and the chancel of Washington Cathedral after Sunday post-Evensong recitals. On weekdays the boys of the choir sang Evensong on Mondays through Wednesdays, either the treble line alone or with combinations of ATB parts sung by the fellows. The men of the cathedral choir did not sing weekday Evensong in those days. On a weekly rotation each fellow also had an opportunity to direct the choir during the weekday Evensongs. On Friday morning there was a service in the Great Choir which the fellows designed and implemented, each fellow taking a turn at leading at approximate six-week intervals, all under the supervision of the college chaplains. 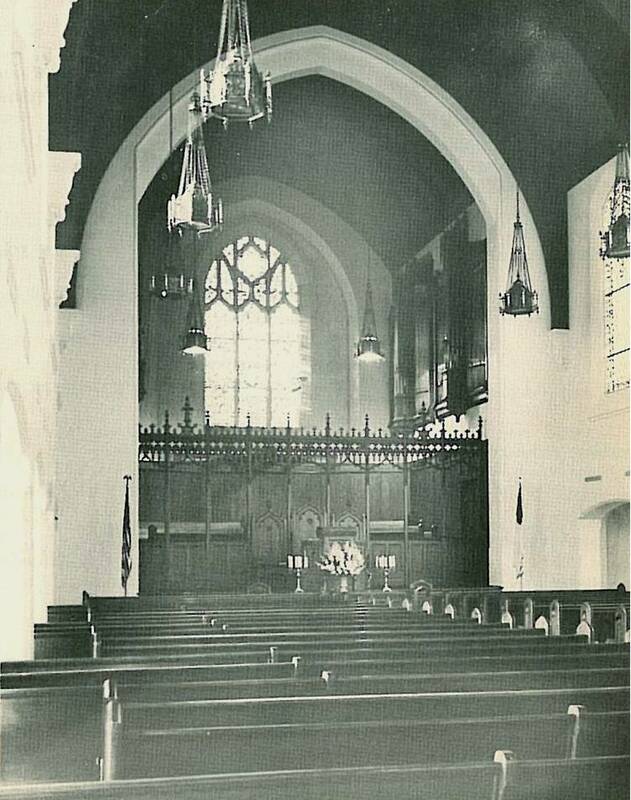 St. Alban’s School for Boys (from which student body cathedral choirboys were selected), and the National Cathedral School for Girls held daily chapel services in the cathedral, and the Beauvoir elementary school held a weekly chapel. As needed, fellows were found playing for these services. 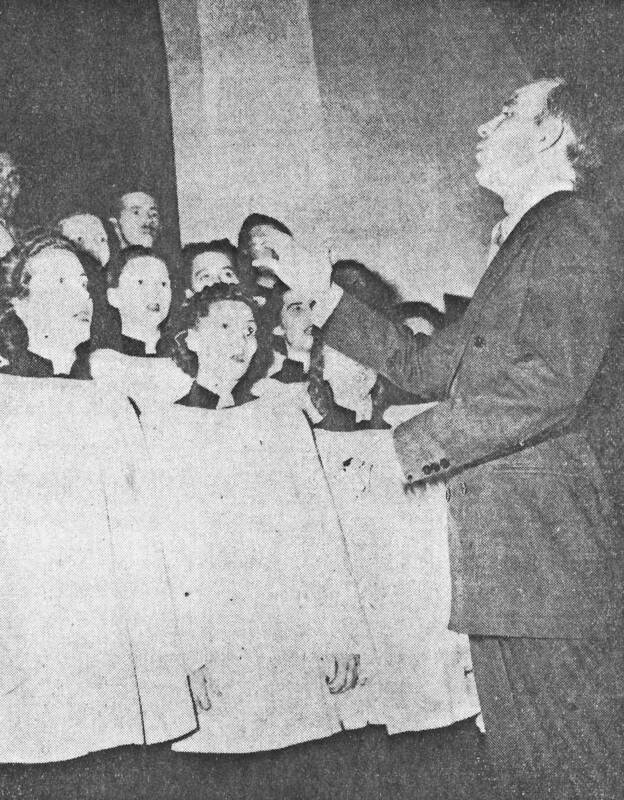 Dr. Callaway at a rehearsal of the Cathedral Choral Society. Fellows were also expected to attend the full practice of the cathedral choir on Friday evenings, which was thorough and long. The evening began in the choir room with the full choir of men and boys rehearsing the hymns and psalms for the for the coming Sunday morning and afternoon services, followed by rehearsals of the communion service settings, canticles, and anthems for the coming Sunday morning and afternoon services in the Great Choir with organ. Following a break, it was back down to the choir room to rehearse the settings and anthems for the following week. After this was a second break at which the boys were dismissed, following which the men read through the settings and anthems for the third week out. From beginning to end, the men were lucky if it was a three-hour evening. Dr. Callaway at a rehearsal in the cathedral choir room. The College of Preachers on the cathedral close followed a somewhat similar track as the College of Church Musicians, but it tended to sponsor short term courses for clergy akin to retreats or conferences, instead of a dedicated course of study leading to a diploma. But music played a role in its offerings as well, and on several occasions the College of Preachers offered courses in tandem with the CCM on topics such as psalmody or various liturgical trends that were beginning to emerge as part of the fledgling liturgical movement. And, most conferences under the auspices of the College of Preachers contained a worship component with music, just as the day schools did, and the fellows stood at the ready to perform these ancillary tasks as assigned. In all of these endeavors the fellows of the College of Church Musicians were more than mere auditors and scholars. They did more than just study the ideas of sacred music, they were directly involved in the actual music making and its preparations at all levels and learned by doing. They were in fact adjunct musicians of the cathedral and its attendant educational institutions, and this was taken into account in the original decision not to charge tuition. Leo Sowerby had progressively more serious health problems throughout the 1960s and he died from symptoms of a stroke he suffered while in residence at Camp WA-LI-RO in Put-In-Bay, Ohio, on July 7, 1968 where he had been composer-in-residence for many years. The college continued operations for a while following Sowerby’s death, but the absence of his guiding presence, together with its unstable finances, which were inextricably linked with those of the cathedral in a difficult era, each contributed to its closing in 1969. There were some heroic efforts to keep things afloat and, in fact, for quite a few years following there was a program which called for one or two fellows to be in residence at the cathedral for short periods of time doing the things fellows had always done, but without a prescribed course of study or the granting of diplomas or degrees. Some students transferred to American University or Peabody Conservatory which had close associations with CCM. Robert Baker, Dean of the School of Sacred Music at Union Theological Seminary in New York, offered admission without audition to any students who wanted to transfer. In the all-too-short period of its existence, though, the College of Church Musicians was a powerhouse of serious study, preparation, and performance of sacred music which very nearly transformed the musical life of the entire church, and its influence continues to this day through the legacies of its approximately thirty graduates and the positions they held and continue to hold. Dr. Callaway with fellows Mark McNulty and Raymond Chenault, 1975. Neal Campbell is the Director of Music and Organist of Trinity Church in Vero Beach, Florida, a positon he has held since November 2015 when he came from a similar position at Saint Luke’s Parish in Darien, Connecticut. He is on the committee planning the 2016 conference in Fairfield and Westchester counties. He previously held church, synagogue, and college positions in Washington, Philadelphia, Richmond, and the New York tri-state area. Growing up in Washington he studied organ with William Watkins and Paul Callaway, piano with Roy Hamlin Johnson, and choral conducting with Paul Traver. He attended the University of Maryland and holds graduate and undergraduate degrees from Manhattan School of Music in New York. Organists, and other musicians, in the early 1970s who—such as I—were not New Yorkers, would have known the name CHARLES DODSLEY WALKER as the president of the American Guild of Organists. He wrote a column that appeared in the monthly magazine, complete with the picture that is on the back cover of the book of remembrances, together with a facsimile of his distinctive signature—the three names connected in one continuous cursive script. In the summer of 1972 I was a finalist in the Guild’s young organists’ competition held during the national AGO convention in Dallas, and I went to the whole week of events—and it was there that I encountered Charlie Walker for the first time, though I don’t remember that we actually met. At the concluding banquet Charlie gave a speech that was vintage CDW! 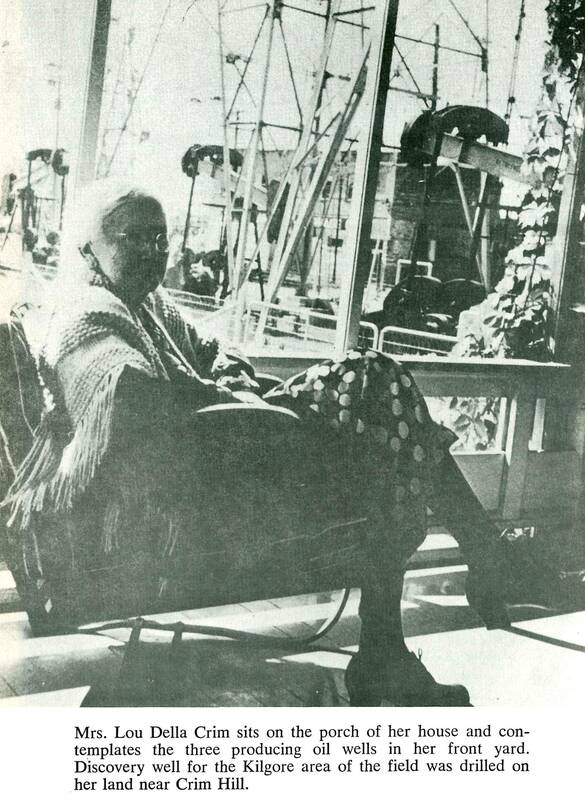 “There was a young lass named Alice, who found herself convening in Dallas.” . . . that sort of thing. Well, he continued through the letters B and C and it appeared, for all the world, that he was going to continue through the entire alphabet, and you could see a sort of gleeful trepidation began to appear on the faces of the confreres as they contemplated just how he was going to negotiate the upcoming sixth letter of the alphabet! Then, all of a sudden the work took some sort of funny unexpected turn which had everyone convulsed in belly-aching laughter, and was entirely void of any sort of risqué-ness, and it seemed almost to chastise the audience for thinking it might be anything naughty! I mentioned this to Charlie once and he said he didn’t remember anything about it—but, Lise, if we ever find that speech, I want a copy to see just how he turned that around! With James Bryan and Alec Wyton, 1968. With Lee Hastings Bristol, Jr, 1972. Through a fortuitous, and felicitous set of circumstances (felicitous—that’s a word Charlie liked and used a lot ! ) . . . Charlie applied for a vacancy as assistant organist of Saint Luke’s and of course we were glad to have him, but I didn’t want his title to sound quite so junior and student-like, so I proposed Artist-in-Residence, which we settled on and felt covered his position nicely. But he threw himself into whatever he was asked to do with real enthusiasm, which was infectious to all of us. And he welcomed us into his concerts here and in Carnegie Hall. Early on we settled into a routine. He and Lise would drive out to Darien on Thursday and Sunday. When he would arrive he’d come to my office and—evoking his best Navy manners—would say “aye, aye sir—reporting for duty” . . . and we’d be off. As time went on, he amended his greeting by extending his hand, looking me straight in the eye saying “beloved friend and colleague—it’s so good to see you.” At first I thought he was being playfully obsequious. But as this pattern continued—both on Thursday and Sunday—I realized that he was absolutely sincere. I was his beloved friend and colleague . . . and he was mine—just as all of us gathered here were his beloved friends and colleagues. The organizations with which he was associated really were his extended musical family and I think he really loved his colleagues and went out of the way to sustain and support the many disparate sorts and conditions of his fellow organists and musicians that came under his care. Anyway—at these Thursday visits, we would quickly dispatch with whatever details we needed to cover regarding that evening’s rehearsal, or the upcoming Sunday service, or the calendar. Then—quite unplanned or rehearsed, we would simply visit for a while, sometimes maybe even for an hour or so, on any number of topics, but usually having to do with the personalities of our profession, past and present. I wish I’d had a voice-activated in-house recording system, like the Nixon White House, for these visits. But as his 90th birthday approached, I did arrange for a series of visits with the digital recorder on, and the results of those visits are about twelve hours of conversations, which were boiled down to the two articles of interviews published in The Diapason, links to which are on the back of your Book of Remembrances. Of course we talked about Paris a lot, and at some point he remarked that his predecessor at the American Cathedral had been Robert Owen, the noted organist of Christ Church Bronxville for many years. Well, I knew Bob Owen and Christ Church, so I looked in the recently-published centennial history of that great parish, and—sure enough—there were the references to Robert Owen and the American Cathedral in Paris. But what I noticed in particular while perusing that book was a tribute to Bob Owen by one of his former choirboys who had become a priest, who was quoted as saying at some event . . .
Christmas Eve 2007 was Charlie’s first with us at Saint Luke’s. Like many places we offer a half-hour of music before the services, and the choir begins in the back of the church singing “Once in royal David’s City,” the first stanza sung by a soloist, the second by the choir unaccompanied, and the remaining stanzas with the organ and congregation joining as the choir processes to their places in the chancel. Charlie was at the console, and I was conducting the choir from the back of the nave. At the appointed time and in the agreed upon way, Charlie gave the pitches for the soloist: [sing D-F#-G]. Unfortunately, there was just enough conversational buzz in the congregation that the soloist—one of our best young choristers—didn’t hear it. Now, I don’t have perfect pitch, but I went over to the soloist and got close to her ear and repeated what I thought were the correct pitches. But, I got it a half-step high! Well, the soloist negotiated it perfectly, but when she got to the third line “Mary was” I knew it was too high and we were in trouble. Verse 2 by the choir was just fine unaccompanied. It actually sounded nice in the key of A-flat, but I dreaded the train wreck I knew was coming when the organ would come in for the third stanza in the published key of G.
But . . . when we got there . . . it was just fine! A bit high for the congregation, perhaps, but it was just fine. Charlie had ascertained what had happened, and simply transposed it to the new key. Now, this may not be evidence of musical genius. But it is evidence of a thorough training, and an engaged mind doing all that he could to see to it that the wonders of God were conveyed—or at least, not derailed—that Christmas Eve by his being nothing more than what he was—a superb musician. I’m sure each organization represented here could tell similar tales of his musicianship revealed similarly, in ways great and small . . . obvious and less so. On the eve of his birthday in 2013, following a Thursday evening choir rehearsal at Saint Luke’s. The week before he died, I visited Charlie in his room at Lenox Hill Hospital. He was weak, to be sure, but he was alert, had that inimitable gleam in his eye, and his creative command of the vocabulary—so, we visited for an hour or so about all sorts of things, just as we had so many Thursdays in my office. I hadn’t seen him since Christmas and his last concert with Canterbury—so we visited about all of that. I showed him some pictures on my hand-held, including some from our visit at the Lake Delaware Boys Camp last summer. It also just happened to be his and Lise’s 14th wedding anniversary. So we had lots to talk about! Finally it came time for me to go and I leaned in close to say good-bye, knowing for myself that it was possibly for last time. As I was walking out of the room, Charlie called to me saying “I hope I see you again.” All I could manage was a smile and nod . . . and I left. With NC, Arthur Burrows, and Jun Kim at Saint Luke’s, 2011. With Fr Ray Donohue, Lake Delaware Boys Camp, Summer 2014. With some of his Voice for Life students at Saint Luke’s. At the console of the organ in Church of the Heavenly Rest following a Canterbury Choral Society concert. The following article appeared in the May/June 2015 issue of the Newsletter of the New York City Chapter of the American Guild of Organists, of which I was the editor at the time. Born in Birmingham, Alabama, McNeil Robinson quickly developed a prodigious technique and repertoire as a pianist, studying at the Birmingham Conservatory. In his teenaged years he played with the Birmingham Symphony Orchestra (now the Alabama Symphony Orchestra) on several occasions. Neil attended Birmingham Southern College as a scholarship student, and in 1962 came to New York City to study at the Mannes College of Music with Leonard Shure as a full scholarship student. He also studied piano privately with Rosina Lhevine and Beveridge Webster. In 1965 he entered Juilliard where he studied organ with Vernon de Tar and Anthony Newman, and composition with Vincent Persichetti. As his renown as a performer and improviser increased, prospective students began to seek out McNeil Robinson, and his teaching career began to increase, especially after he left the rigorous liturgical schedule at St. Mary the Virgin. As his private studio increased, he also assumed a faculty position at Mannes. In 1984 at the invitation of John Walker, he joined the faculty of Manhattan School of Music, later becoming chair of the organ department after John moved to Pittsburgh in 1991, a position which Neil held at the time of his death. During this era he taught a succession of students who have gone on to significant careers of their own, and who have won numerous competitions and prizes. A tribute on the web site of the American Guild of Organists notes that he taught more winners of the AGO Improvisation Competition than anyone else. As a composer his work continued to be performed in venues throughout the world, including several national conventions of the AGO, where his organ concerto was first performed at the National Convention in San Francisco in 1984. His liturgical compositions regularly find their place in the music lists of Roman Catholic, Jewish, and Protestant houses of worship throughout the country. After St. Mary the Virgin, Neil’s church career trajectory took him to a lengthy tenure at Park Avenue Christian Church, and later Holy Trinity Roman Catholic Church, from which he retired only last fall. May his memory be for a blessing. Rest in peace, maestro. 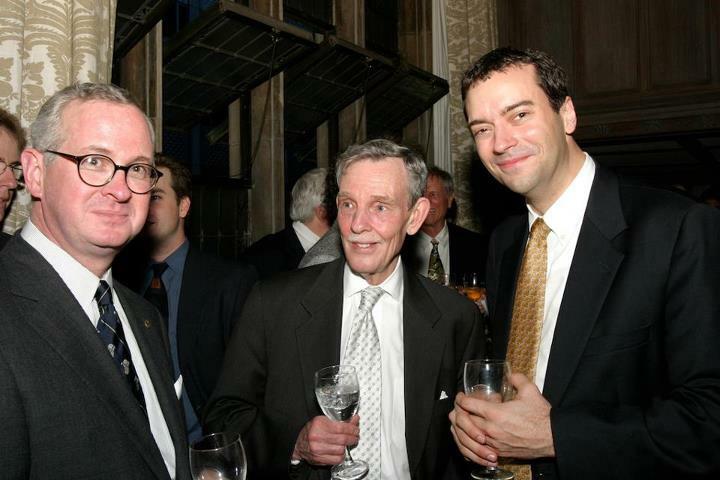 With Peter Stolzfus Berton and me at the Hancocks’ Farewell, Saint Thomas Church, New York, May 2004. Were it not for the East Texas Pipe Organ Festival Roy Perry’s name might be relegated to a footnote among students and enthusiasts of Aeolian-Skinner history and folklore. But what an enduring footnote it would have been, all the same. A happy confluence of events led to the appointment of Lorenz Maycher to Roy Perry’s former Kilgore post in 2010, and it was his inspiration and vision that established this festival, honoring the life and work of Roy Perry and the Williams family of organbuilders from New Orleans, featuring five organs which Perry finished and had a hand in designing, and which the Williams installed and maintained for approximately 30 years. For the first festival in November 2011 I was asked to present a talk about Roy’s life together with remarks about the music associated with Opus 1173, and that is largely what is given here in narrative form, using many of the same photographs I used in the live talk. First, his own larger than life personality and musicianship yielded an impressive list of sales for the company. And, it must be said, at that time Aeolian-Skinner was the preferred organ of most organists, even of those couldn’t afford it or could not wait for the three-year backlog of orders. Roy often said that the organs sold themselves: once prospective customers heard his home organ at First Presbyterian Church, Aeolian-Skinner’s Opus 1173 or it’s sister organ in the First Baptist Church in Longview, one opus number younger, they were hooked. By his own reckoning he was responsible for about 25% of the company’s sales during his time with the company. Part of this was because he shared the sales territory commissions, as well as the work of installing and finishing organs, with the Williams. For a fuller account of this, see Nora Williams’ Interview. And it’s really impossible to appreciate and assess these organs without understanding the family like association between Roy and the Williams family which, for most of his career, consisted of father and son, T. J. “Jack” and J. C. “Jim” and their wives Sally and Nora. It was a real family enterprise. By the time I came to know Roy in 1972 Jack and Sally had died, but Jim and Nora continued the family business in taking care of these organs and many others throughout Texas, Oklahoma, and Louisiana. 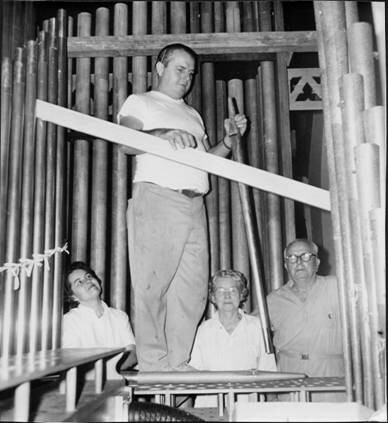 Left to right: Nora, Jim, Sally, and Jack Williams in the Kilgore organ ca. 1966. Second, the Perry sound. A few years ago a graduate student consulted with me about his proposed dissertation about Roy Perry; he wanted to see all of the organs with which Roy had been associated, taking measurements and obtaining empirical information in his attempt to identify the uniqueness of Roy’s organs (and I suppose to defend his findings before a panel of examiners)—a noble undertaking reminiscent of Donald Harrison’s first trip to Germany wielding calipers and other measuring tools in an attempt to gather definitive information which would enable him to replicate the sounds of Silberman et al. But the real sign of GDH’s genius was in quickly giving that up in favor of just listening and absorbing the sound, ambiance, and ethos of these historic organs so that when he arrived back in America, he could incorporate what he had heard in creating his own instruments, which may have been informed by the past, but were uniquely modern. He is a top notch finisher and during my periodic visits to Texas I cannot remember a time when I have had to suggest that something might have been done a little differently. He just has that kind of organ sense. Better than any other analysis, this explains how Roy’s organs bore the original stamp which is hard to miss by comparison with Aeolian-Skinner’s many other fine organs. Lastly, his work as a practicing organist and church musician was well-known within the region of East Texas and was recorded for posterity in the Aeolian-Skinner King of Instruments series of recordings, many of which have been reissued in modern formats. See Review of Aeolian-Skinner’s “King of Instruments” series of recordings, Volumes 1-3 remastered by VTOA | Neal Campbell–Words and Pictures. These, and the few private recordings of Roy’s playing that exist, are tangible reminders of the color and personality which were imbued in his playing over his forty-plus years as a church organist. Also, Roy’s understanding of the physical attributes of the churches in this part of the country and his forthright dealings with his colleagues and clients also figured prominently in the effectiveness of his work. Then, of course, there is the not inconsequential work he undertook with Jim Williams apart from the company in the later years of Aeolian-Skinner’s existence, most of which still exists. His final statement and undoubtedly his most highly visible work was the renovation of the organ in Washington Cathedral from 1973-76. This large-scale project was indigenously complicated and was a committee-driven project occasioned by the cathedral’s unique physical properties and its liturgical and logistical requirements, all of which was undertaken just as the Aeolian-Skinner company ceased operations. Ostensibly designed by Joseph Whiteford, who oversaw the work from his home in California, he never made the trip to Washington to see either the work in progress or the final outcome. Roy’s official title was supervising architect and finisher, but in practical matters, he was the boss of the job. The details of Roy’s early life are sketchy, at best. 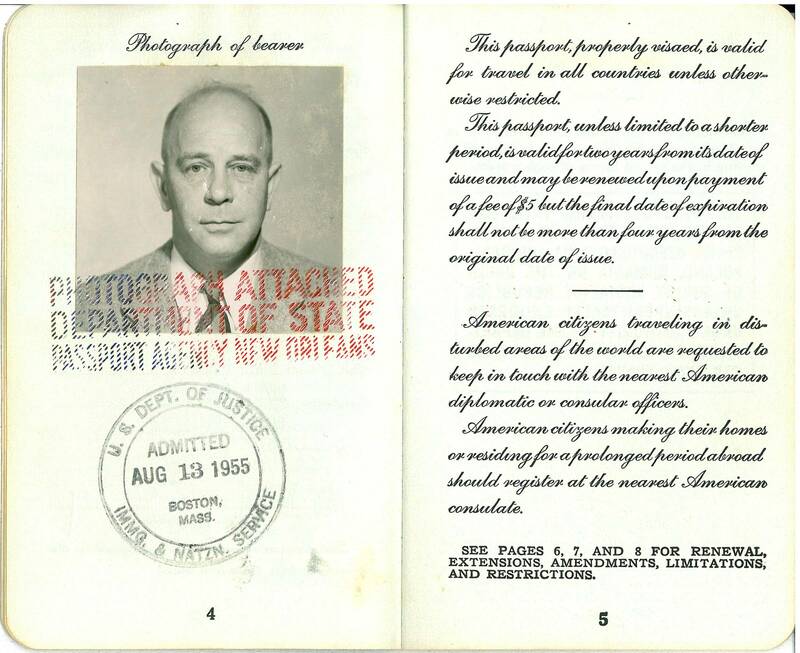 He was born on September, 27, 1906 in Indian Bayou, Vermillion Parish, Louisiana, near Lake Charles. Most of what we know comes from an autobiographical piece Roy wrote himself as a mature adult titled Poor Bob’s Boy, the title of which refers to the fact that his father (Bob) died some time before Roy was born. He had an unstable home life. I’ve not been able to find out the circumstances of either his father’s death, or any biographical material about his mother or step father, except anecdotal suggestions that the step father drank too much and was abusive. It seems that as a boy Roy was passed around to be reared by assorted women of his extended family, notably his grandmother and particularly his Aunt Jenny, his father’s sister, who first recognized his ability. It was she who provided anything resembling a continuing family presence and he kept in touch with her and even visited her in July 1964. He did have a half-sister who lived in California whom he visited at least once as an adult. In elementary school Roy had a music teacher, Mrs. Ora M. Reams, who came to his school once a week, teaching the elementary principles of solfège. Roy was naturally bright, possessed a keen intellect, absorbed everything around him, and grasped information quickly. In his mid-teens he was already self-sufficient and had jobs playing in a Jewish temple and a movie theatre near Lake Charles. At this point he did take some formal lessons with Mrs. Reames. By the time he came to the attention of anyone in Kilgore, he was the organist of St. Cyprian’s Church and The Pines Theatre, each in Lufkin, some thirty miles south of Kilgore. And at some point he was confirmed in the Episcopal Church. Roy’s coming to Kilgore in 1932 at age 26 was simultaneous with the East Texas oil boom and his own life was quickly intertwined, inextricably so, with the Crim family, the owners and beneficiaries of the largest tract of oil-producing acreage in what came to be known as the East Texas Oil Field. And it was on this land that oil was found, and in a big way! W. R. and Moma Della had four children: J. Malcolm, Pauline Florence (later, after her first husband died, Pauline MacIntosh) John Thompson Crim (later, John T., Sr. after the birth of his son; Roy, who had a nickname for everyone, called him Santa Claus), and Liggett, the youngest, who was always interested in things theatrical. Each of the Crim children was in various ways devoted to the newly incorporated town and their family church, the First Presbyterian Church. 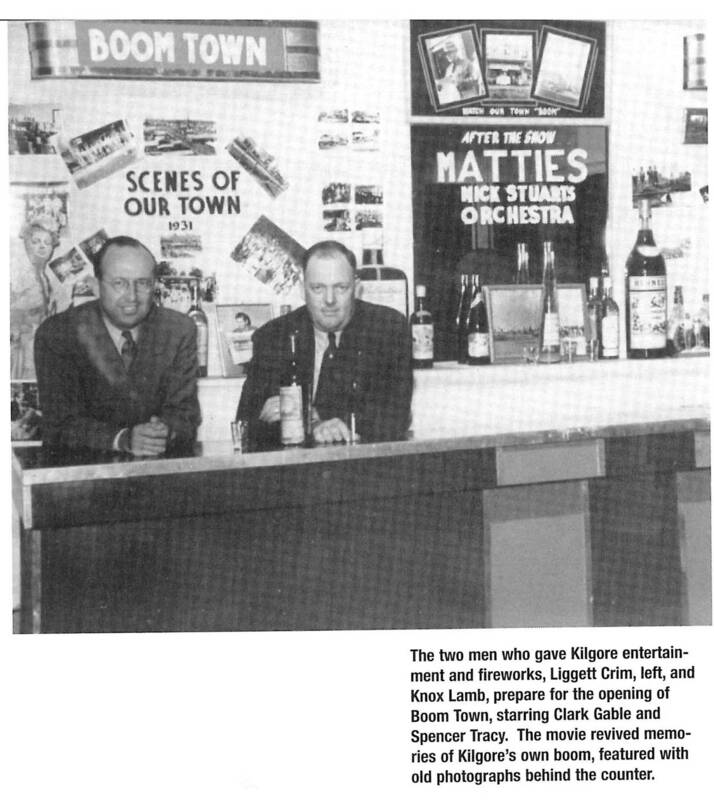 In 1931 Malcolm became the first mayor of Kilgore, and Liggett owned a chain of movie theaters in Kilgore and the surrounding area. Managing this chain of theatres was a man named Knox Lamb, who—in various ways as time went on—also made his living in and around the theatre, including a long period on the technical staff of Kilgore College. The First Presbyterian Church of Kilgore had its beginnings in the mid-19th century in a settlement just south of present-day Kilgore called New Danville and was known as the Gum Spring Presbyterian Church. A circuitous series of events having to do with the expanding railroad and property belonging to Constantine Buckley (Buck) Kilgore led to the founding of a new town. At a meeting of the church congregation in 1874 it was voted to move the church four miles into the new town, using the name New Danville Presbyterian Church, commemorating its original location. 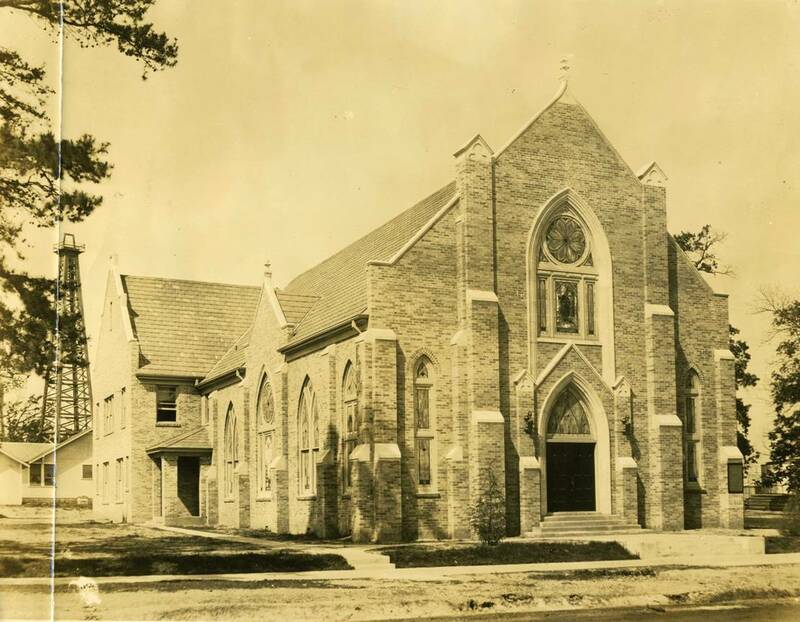 By the end of 1885 they had built a new church at the corner of South and Rusk Streets in Kilgore. The Crims were devoted members of the church. 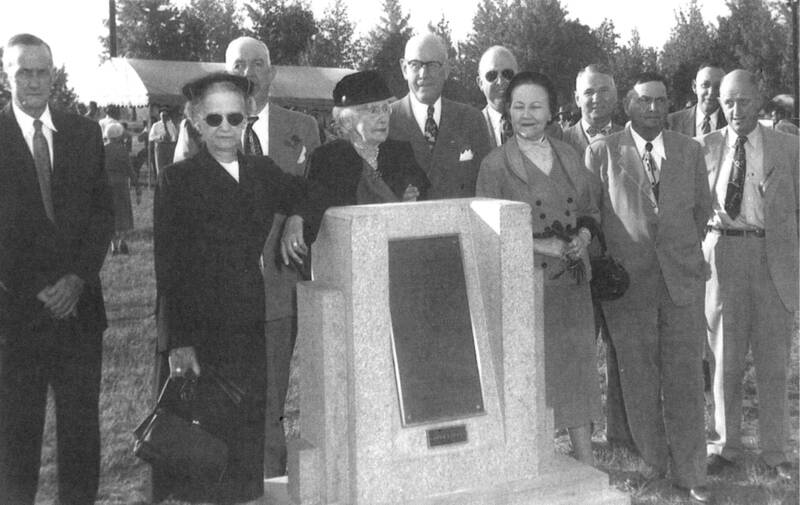 Lou Della Crim, center, Malcolm Crim to her right, John T. Crim to her left, Leggett Crim to his left (in sun glasses), the Rev. Shirley Guthrie, far right. In 1930 rumors began to surface about the possible presence of oil in the area. 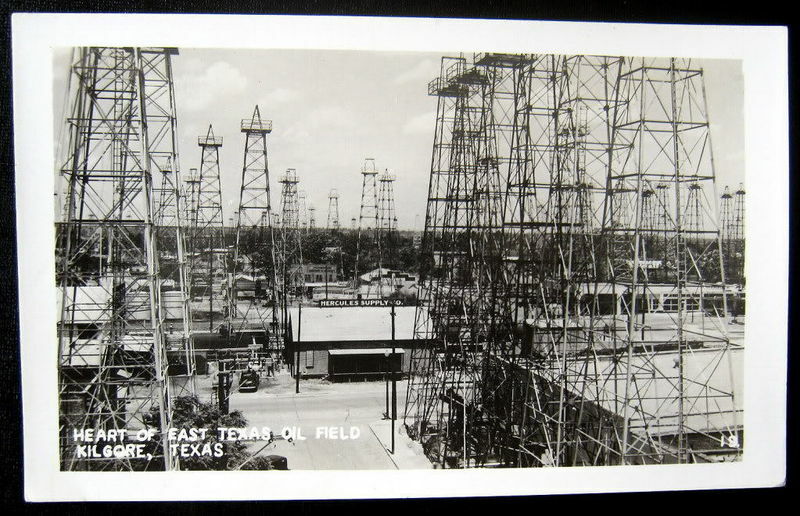 The speculative wells drilled on the Crim farm were not the first to come in, but when they did, in late 1931, they produced the largest share of what became known as the East Texas Oil field. Moma Della was in church on the Sunday the wells on her property came in. At this time the area surrounding Kilgore consisted largely of rural cotton-producing farms, all of which were caught in the grips of a devastating drought. No sooner had the oil wells come in than Malcolm Crim, owner-operator of a his family’s local general store, with whom everyone in town did business, declared that all debts were forgiven, and he invited his customers down to the store where he tore up their IOU papers into scraps and burned them saying “we’re wiping the slate clean, we’re even with everybody.” He knew what conditions were like for his fellow citizens and he knew immediately how the discovery of oil would change all of their situations for the better. It was also an early example of the many similar charitable acts for the good of the community that the Crims performed in the following years. The story of life in Kilgore in the earliest days of the oil boom is a fascinating tale beyond the scope of this article, but it is integral to the church story to recall that in May 1931 the East Texas Railroad Commission tried to control oil production and to ration amounts to be produced. Chaos ensued resulting in what was later known as the Great Oilfield War, which caused the governor to declare martial law. Oil which had been priced at $1.15 per barrel before the discovery, fluctuated afterward to as low as $.02 per barrel! Downtown Kilgore at the height of the oil boom. In the midst of this frenzy of events, an incendiary fire broke out in Kilgore—probably arson, though never proven—which destroyed the Baptist, Methodist, and Presbyterian churches. The rumor that circulated was that it was disgruntled oilfield workers who had started the fire because they were angry that they had lost their jobs because of the ration order which shut down too many wells. The new First Presbyterian Church, with one lone derrick in view, shortly after it was built at South and Rusk Streets. In short order a new church in a modest Gothic style was built on the same site, which came to be known as the First Presbyterian Church. It was outfitted with a six stop organ built by Pilcher. It was to this church and this organ that Roy Perry came to Kilgore to be the organist and choirmaster in 1932. The new church had no organist, and the story is told that Liggett Crim mentioned this casually to Knox Lamb, the manager of his chain of theaters, and it was Lamb who suggested to Crim that he consider the organist of his theater in Lufkin. Nora Williams tells the engaging story of waking Roy up in the middle of the night, more or less commanding him to go over to the Pines Theatre to “audition” for Liggett, only to find that the building was locked. So, Lamb just kicked the door in and then went in and we assume the audition was successful. Nora Williams Interview So it was that Roy Perry moved to Kilgore, initially living with Liggett Crim and his wife Tincy Elder. 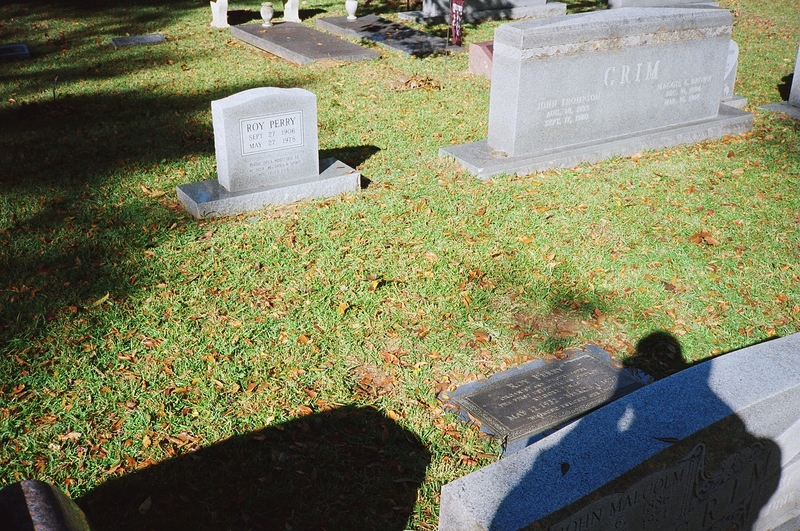 Beginning then and there, Roy’s life was closely linked to those of the extended Crim family for the rest of his life, and he ultimately was even buried in the family cemetery, Thompson Cemetery at Laird Hill, just outside of Kilgore. Roy immediately set out to make improvements and additions to the modest Pilcher organ, enlisting the assistance of Jack Williams whom he had known in Lufkin. Williams was an independent service man, but he did a lot of work for Möller, and he installed the new organ which Möller built around the small Pilcher. This was during the time the noted English voicer Richard Whitelegg was associated with the company, although it is uncertain that he had any influence on this relatively obscure job. 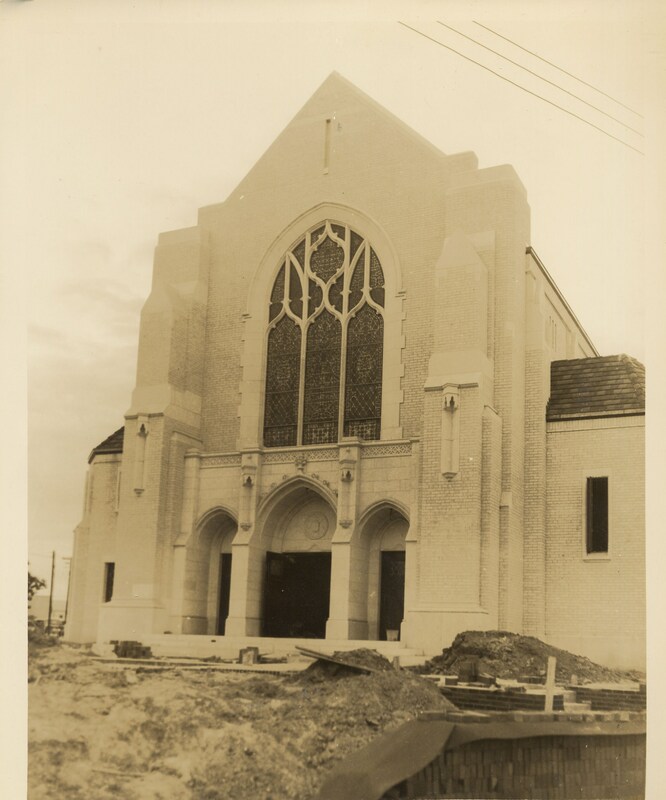 In 1935 Roy established a recital series at the church on the new organ and brought noted organists to town, including Hugh McAmis, the civic organist of San Antonio, and a youthful Virgil Fox, then 23 years old. Virgil and Roy remained friends and Fox played and visited several times in Kilgore over the years. Roy composed a piece titled Lamento for Fox’s 1936 debut in Carnegie Hall in New York, although the piece was not listed on the program. The Crims financed Roy’s education in sending him to New York for two extended periods of time, where he went to study with Hugh McAmis, by then relocated to New York. I’ve not been able to ascertain precisely what connection led him to seek out McAmis, other than their previous association in Kilgore. McAmis at the time would have been 36 years old, and tragically died in 1942 shortly after being drafted into the Army and reporting for basic training duty. David McK. 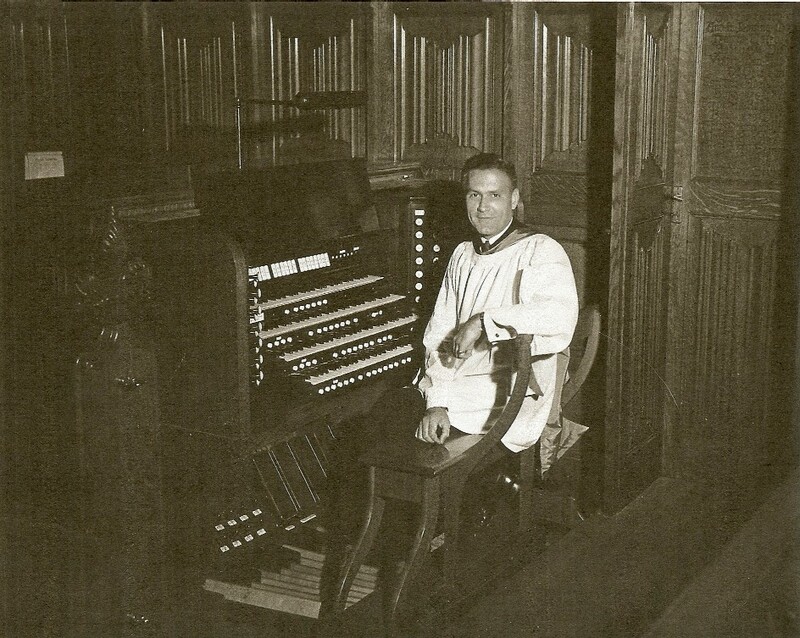 Williams, the legendary organist of St. Bartholomew’s Church on Park Avenue, was at the height of his powers and was very popular and influential among organists in New York. Hugh McAmis was very proud of his friendship with David and the two of them and Roy socialized often. Roy’s accounts of some of their frolics are more reminiscent of the Jazz Age than of the lingering depression which gripped most of the country. But the one thing that David said which made a lasting impression on Roy was something to the effect of “how nice that you’ve come to New York to study with Hugh. But don’t stay here. Go back to your people and thrill them with your music, and one day I’ll come visit you.” True to his word, David McK. Williams did come to Kilgore for a memorable visit. McAmis was the organist of All Saints Church in Great Neck, a suburb of New York on the north shore of Long Island. F. Scott Fitzgerald’s novel The Great Gatsby is set in the fictional villages of East Egg and West Egg, and it is in this part of the so-called “gold coast” of Long Island where Great Neck is located. McAmis composed a new piece titled Dreams and dedicated it to David McK. Williams. Roy told the story of going out to Great Neck with David for the recital which included the new piece, which includes some very prominent single notes from the chimes of the organ. David must have known the new piece, because just prior to its being played on the program he said in his well-known, inimitable, not-so-discrete stage whisper “This piece will have chimes!” He then pantomimed the chimer pulling the ropes of the chimes at the appropriate places during McAmis’ performance, which apparently caused something of a scene. Dreams continued to be popular in general and always held pride of place in Roy’s repertoire and on programs in Kilgore. Meanwhile, back in Kilgore, almost no plot of ground in town was left without an oil derrick pumping away at all hours of the day or night. The footprint of the new church was not immune from the boom and no fewer than five producing wells occupied the same earth as the church which weakened its foundations. 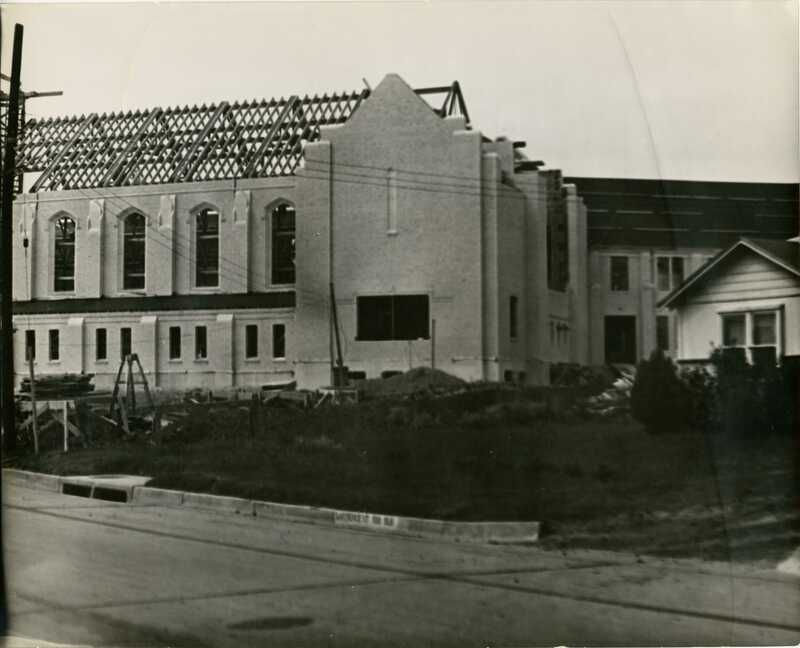 Finally, the church proper was torn down, leaving the education building standing alone, where it functioned as an adjunct church facility and, later, a youth center well into the 1950s. Dave Garroway’s television program “Wide, Wide, World” even did a segment on the church in Texas that had been torn apart to make room for the rig in search of oil under its foundation. And so it was that in October 1938 a portion of the congregation gathered at Main and Lawrence streets to break ground for yet another church building. 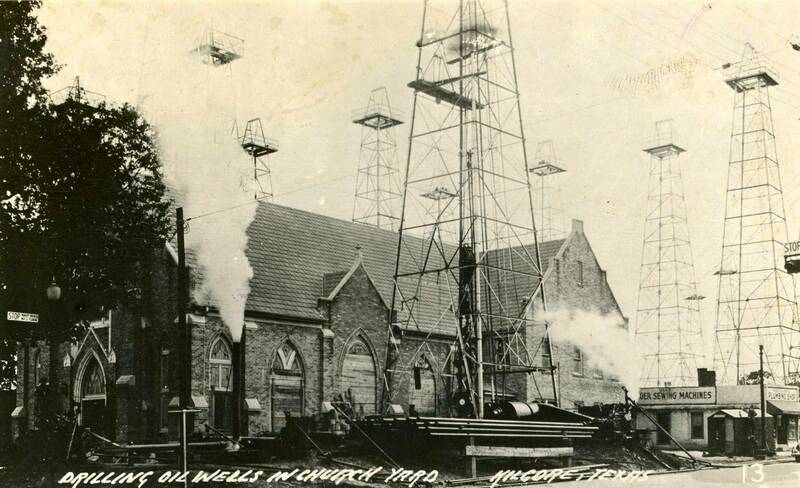 In spite of the fact that the old church was but six or seven years old, it was not a particularly difficult decision to raze it and build anew, given the concentration of producing wells in the confines of downtown Kilgore. A humorous story survives about the initial fundraising which gives us a clue to the slightly twisted humor of the minister, the Reverend Cecil Lang, and of Leggett Crim. Knowing that a gathering of men was scheduled for the purpose of raising what we would today call “leadership gifts” for the new church, Lang and Leggett had surreptitiously entered the room and wired a chair with electricity. As men gathered for the meeting, Leggett made sure that his oldest brother, Malcolm, was seated in that chair. As the Reverend Mr. Lang solemnly asked “Who’ll give the first ten thousand dollars for the building of the new church?” Leggett pushed the button releasing current to Malcolm’s chair. Malcolm, literally shocked, bolted straight up out of his chair. Lang thanked him graciously for his enthusiastic and generous contribution, and the meeting continued! Proposal for the new church. The tower was not built. John T. Crim was the chairman of the committee which oversaw the design and construction of the new church, which is a fine representation of the Gothic spirit; there is even a rather elaborate rood screen separating the choir from the pulpit rostrum, a fairly unusual attribute of any protestant church, especially in this part of the country at that time. And its proportions and lack of artificial sound-absorbing materials, are perfect for organ and choral music, also something of a rarity for this time and place. It seems obvious that Roy Perry had a firm hand in this outcome, and as he told me the story in his typical hyperbole, you’d think that he had actually designed it! I imagine he was forceful and demanding in his requirements and he probably did show the committee and architect the historical precedents upon which construction was founded. And as construction proceeded, it must have been an incongruous sight in boom town Kilgore. Roy was drafted into the Army, but soon received a medical discharge. He was even listed in the honor roll of the men of First Presbyterian Church who were in the service of their country. Never in what would be described as robust health, Roy evidenced problems with his sight fairly early in his Kilgore days. He once had an automobile accident while borrowing Liggett Crim’s car: he said he simply didn’t see the other car and he never drove again. His eyesight was always a difficult issue. He also developed in the mid-1950s the tremor that was to plague his playing and handwriting for the rest of his life, presumably from Parkinson’s disease, although that diagnosis has been disputed by some, so it’s hard to confirm just what was the cause of the tremor. Thus church music, like all music, is a matter of taste—and taste is simply a matter of experience. For that reason we cannot approach the subject of church music objectively nor apply the standards which we know to be good until we have educated the taste, that is, widened the experience of our congregations; and to this slow and difficult process they offer the most strenuous and highly articulate objection. I am not arguing that great music will make people religious; nor do I think that a performance of the B Minor Mass will deter a man from stealing chickens. Music is an art, not an ethic. But it is strangely true that the church’s contribution to the art of music has been greatest in those periods where the religious life of the church was at its highest vitality. We shall not bring on the great return to religion by replacing a Palestrina motet for Pull for the Shore. But we can strive when we offer up music before God’s altar (In the Old Testament sense, if you will) to make the offering the best it is humanly possible for us to get. Have some positive ideal about your profession. Do not forget that you are working in a field that J. S. Bach and César Franck lifted to the pinnacle of greatness. Be constantly sharpening your tools and raising your sights. Keep in touch with the big people in your profession. When you get a vacation in New York, spend your Sundays in church instead of in bed with a hangover. and other queries before which reason and experience are helpless. These things are in the realm of faith, and are felt rather than taught. And it is exactly here, where the logic of human speech is helpless, that the imaginative factor in art and ritual and music is most eloquent. Develop your sense of humor–and by a sense of humor, I do not mean a ready guffaw for parlor stories. I mean the ability to tell a big thing from a little one. Remember that the world is not bounded by the walls of your choirloft. Other people–your choir–have other things for the centers of their lives. Laugh a lot, and always hold out an ideal you cannot quite reach, work hard at your job, and you will be a perennially young institution in your church and community. Special music services, if they are services should be planned with the same attention to unity and dignity as other services of the church. The principal difference would be that in place of the sermon there is some important musical work around which all the other items center. The minister should lead in such services, and certainly should be consulted about scriptures and prayers. But if there is an out and out concert in your church—say a concert by a visiting choir, or an organ recitalist, place your minister in a comfortable pew and have him keep his seat. The business of opening a concert performance with a word of prayer and closing it with a benediction is out of character, and in questionable taste. People come to a concert to enjoy music, not to worship. Casual and thoughtless invoking of God’s blessing on purely secular pleasures is essentially flippant and unwarranted. all these things will pay big dividends in your church’s acceptance of the program you are trying to put across. A little thoughtfulness is a capital investment. I have been a Church Musician for 25 years. I had rather live by this work than any other way I know. I love the Church—although it is uphill work to love some of the people in it—and I believe that a musician can have no higher calling than to serve the Church, and through it, serve God and his fellow-man. 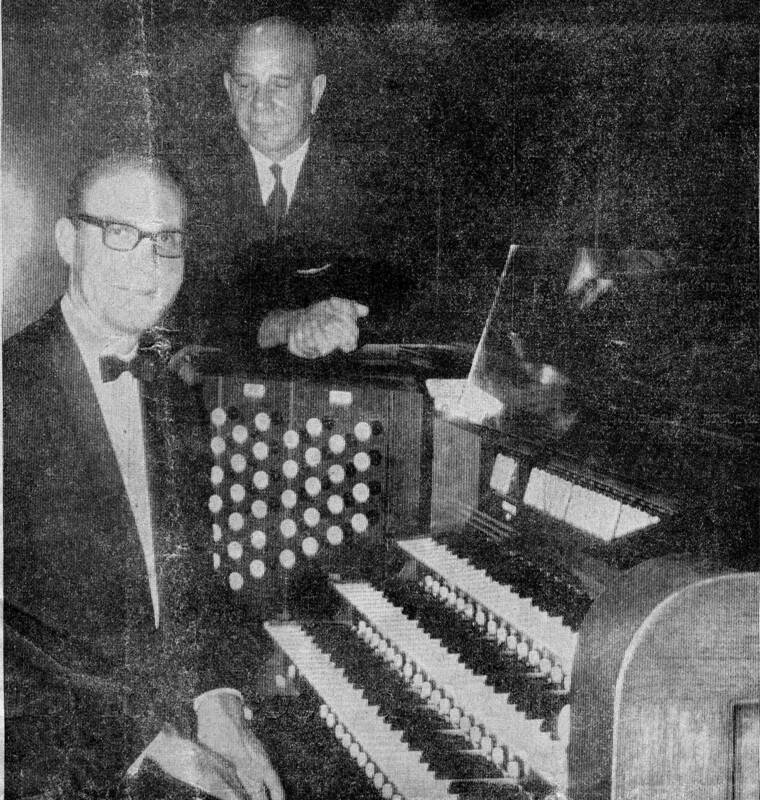 When Aeolian-Skinner installed its Opus 912-A in the First Presbyterian Church in Houston, Roy had the occasion to meet G. Donald Harrison and to tell him about his desire to make some changes to the existing Möller organ in Kilgore. But he was firm in his request that he have Jack Williams and his family install it. Harrison agreed to this as it was A-S’s practice to have local firms known to them install their organs throughout the country. This was the beginning of Roy Perry’s relationship with Aeolian-Skinner which would last until the company ceased operations in 1972. The organ was immediately successful, in spite of (or maybe because of!) the fact that considerable portions of the pipework and mechanical and structural portions of the Möller organ remained. However, the core of the organ bore all of the hallmarks of the inimitable Aeolian-Skinner sound: bold, yet cohesive, choruses and mixtures rich in harmonic development, and fiery chorus reeds, together with evocative imitative solo reeds and a variety of celestes and quiet foundation stops ranging from an impressive forte to a mere whisper. Crowning the tonal development was the Trompette-en-Chamade under the chancel window. In reality, the stop is one of the standard Aeolian-Skinner Trompette Harmonïque designs, just mounted horizontally and winded on moderate pressure. Even visually it is not particularly impressive out in the church, as it is somewhat obscured by the rood screen. But pictured close up against the stained glass window, it was an impressive icon of Aeolian-Skinner’s latest work, which they billed as the first example of a horizontal reed in America, predating their famous State Trumpet at the Cathedral Church of St. John the Divine in New York by several years. It was featured prominently in the company’s sales materials and with articles in the trade journals. Roy immediately began to showcase the organ in recitals, as he had done in the organ’s previous incarnations. Two of the first recitalists to play on the new organ were Catherine Crozier and the 28-year-old William Watkins. Watkins had recently won the first prize in a competition sponsored by the National Federation of Music Clubs which had been held in Dallas in 1949. At the time before any of the AGO competitions this was the most prestigious music competition an organist could enter; it was open to all instrumentalists and Watkins was the first organist to win. For his Kilgore recital the church was full and Roy Perry himself wrote the review that appeared in the Kilgore News Herald; it caused something of a rift in Perry’s friendship with Virgil Fox, who had played in Kilgore several times previously. 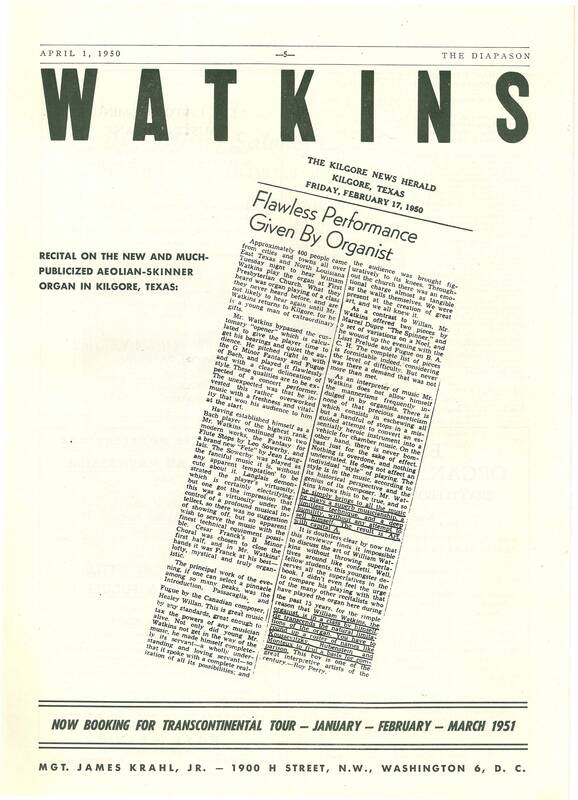 Watkins’ use of it in his publicity also strained his friendship with Fox, his former teacher. 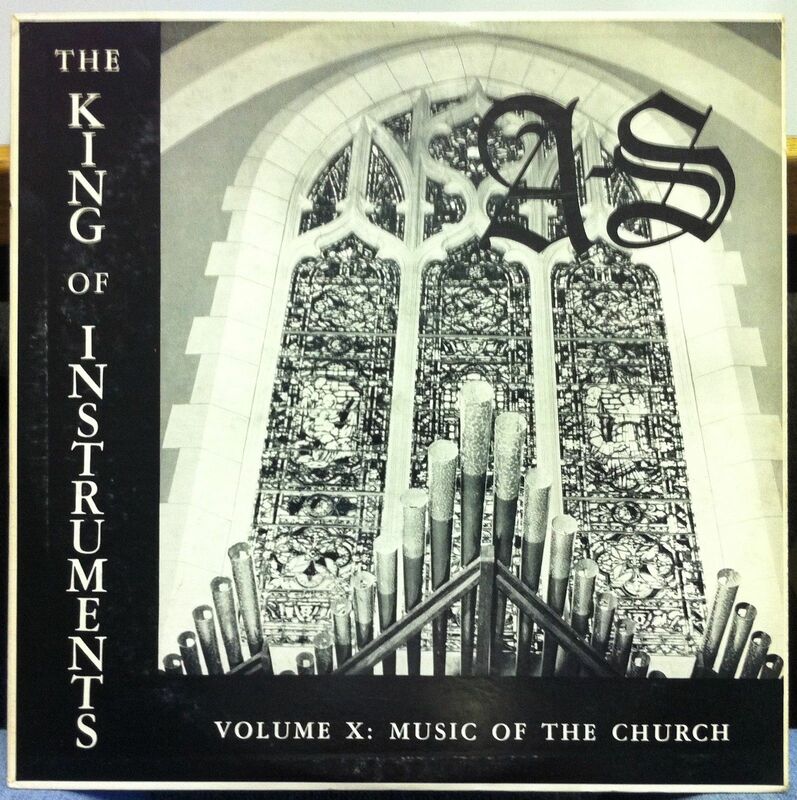 In the early 1950s, shortly after the Kilgore organ was installed, Joseph S. Whiteford launched the “King of Instruments” series of recordings issued by Aeolian-Skinner, which were not only advertising tools for the company, but were an artistic undertaking of serious proportions, capturing the playing of the leading organists of the era on the company’s new instruments. The Kilgore organ was featured prominently in the first two volumes, together with other recent new organs. The latter organ was used to demonstrate the romantic instrument in the second rendition of the last part of the St. Anne Fugue. There were several players used—Thomas Dunn did the examples played at Symphony Hall, Boston. George Faxon, who was then organist at St. Paul’s Cathedral in Boston, did a major part of the examples played on that instrument and also the Trio Sonata which concludes the second side of the record. Roy Perry played the examples at Kilgore. There were just two of them: the opening to the reed section of the record where he used his Trompette-en-Chamade. There is also an excerpt of the Flute Celeste played by him on the same organ. Joe Whiteford played some of the examples, particularly those made at Saint John the Divine. This included the last part of the B Minor Chorale of César Franck. Callahan, Charles. The American Classic Organ: A History in Letters. Richmond: Organ Historical Society, 1990. 414. 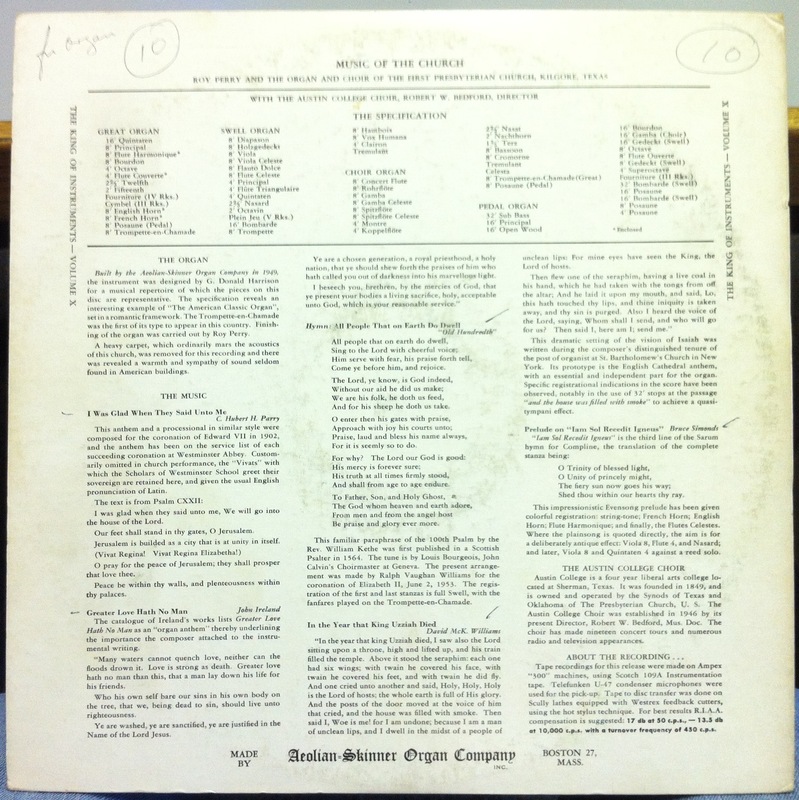 Volume 10, made several years later, featured Roy’s choir and organ of the First Presbyterian Church in Kilgore, together with the choir of Austin College, in an album of church music which, though fairly standard fare today, was largely unfamiliar at the time. Roy did all of the playing for the recording and generally directed the project, although the combined choirs were directed by college choir director, Robert Bedford. The one solo organ work on the album, Bruce Simonds’ Prelude on Iam sol recedit igneous, which was particularly effective in presenting the quiet and imitative stops of the organ, and Roy was largely responsible for introducing this work to the American organ-playing public, in spite of the fact that it was written in 1928 and had previously been recorded by Catherine Crozier at the First Baptist Church in Longview. In my own listening to the individual recordings it is not clear to me who introduced the work to whom, but if I had to guess I’d say that Roy introduced the work to Crozier. Her performance on the Longview organ is similar in many ways to Roy’s recording at Kilgore, and is warmer and more luxuriantly paced than is typical of her playing, at least later in her career. On the other had, we know that Crozier was always passionate about new music and she certainly traveled a lot more than Roy, and in somewhat more exalted academic circles, so it is entirely possible that it was she who initially showed it to Roy. In an example of ever-evolving tastes, David McK. Williams’ anthem In the Year that King Uzziah Died was at the time a very popular anthem which was in the music library (if not the active repertoire) of most church choirs in the country, but has passed out of fashion in recent years. Its descriptive account of the text from Isaiah 6 and the orchestral accompaniment on the Kilgore organ made for a memorable performance, notably in the quasi-timpani effects of the 32’ Bombarde clusters under expression, which were quite a cause of wonderment. What the LP liner notes do not tell is that 32′ sound was courtesy of the Longview organ; Roy borrowed the lowest 12 pipes from it and temporarily set them up for the recording. Kilgore didn’t get its own 32′ reed until 1966. 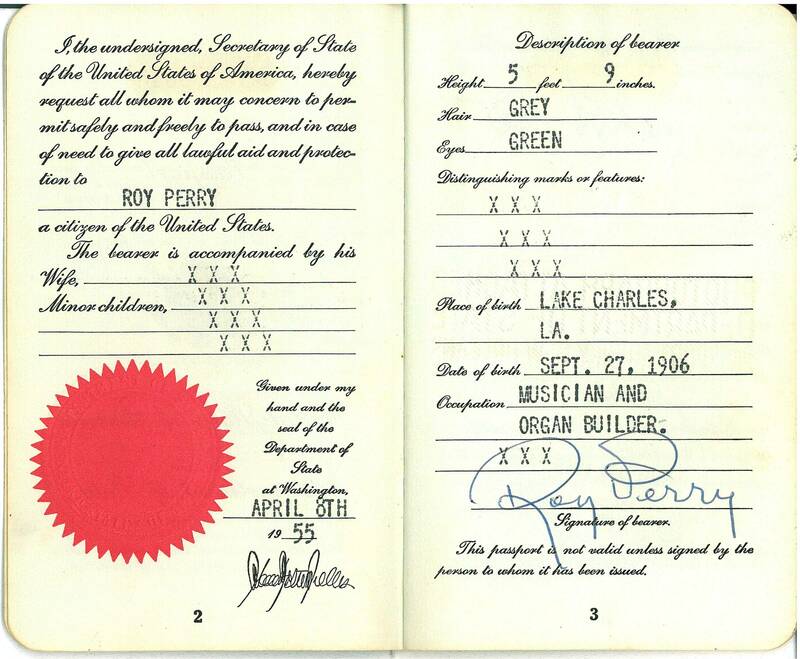 During this summer our representative in Texas, Mr. Roy Perry, will be visiting England with a friend of his and would naturally very much like to meet you and see some of your organs. Also he would like some advice as to those instruments he should see generally in the middle and southern part of the country. Roy Perry, or Perriola, as he is affectionately referred to in our organization, has supervised, with the aid of Jack Williams and his son, most of our important installations in Texas. He is an accomplished organist and has a wonderful ear. He is a top notch finisher and during my periodic visits to Texas I cannot remember a time when I have had to suggest that something might have been done a little differently. He just has that kind of organ sense. I think you will also enjoy him as a personality. He knows some good southern stories and, by the way, he is an expert at southern hospitality. I always look forward to my trips down to his neck of the woods as we have a glorious time just waiting for sundown to start on a little nourishment. I would be particularly grateful for any courtesy you can show Perriola and with many thanks in advance. Donald Harrison also wrote a general letter of introduction for Roy to present to various local celebrities as he traveled through England and France–a typical courtesy of the era. Roy told the story of calling upon William McKie at Westminster Abbey and, as he was pulling GDH’s letter from his jacket pocket, Sir William gently pushed it away saying, “I know who you are; if it weren’t for our English policies, I would have one of your organs here in the Abbey.” Whether he actually would have or not is open to conjecture, but the fact is known that McKie was kindly affectioned to American organists of that era, and certainly knew of Aeolian-Skinner’s work. 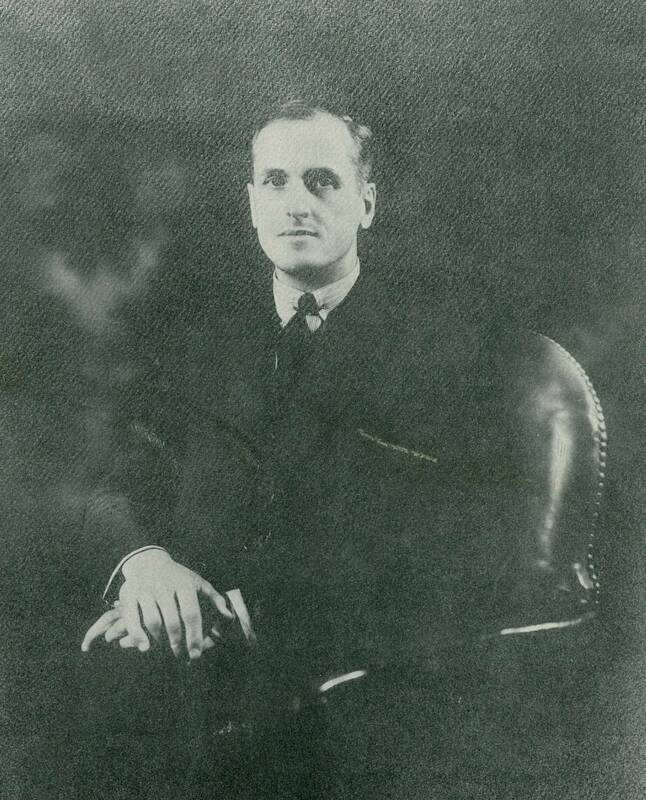 The death of G. Donald Harrison from a heart attack on the evening of June 14, 1956 came as a shock, not only to the Aeolian-Skinner family of workers, but to the organ world in general, so greatly loved and respected was he. He was finishing his work on the new organ at St. Thomas Church in New York just weeks before the American Guild of Organists’ national convention and had to walk home in intense heat because he couldn’t find a taxi during a subway strike. Harrison was heard to say that he considered the St. Thomas organ to be his masterpiece. Ernest Skinner, who was older than GDH by 23 years and outlived him by four years, was by this time openly hostile and vitriolic to the younger Harrison, especially so in the advertising of his own separate company and his letters to the editor in the trade journals. Ever since being forced out of the company bearing his name, it had been a bitter pill for the older man to see his early successes one by one fall prey to advancing tonal ideals which were now favored by the leading organists of the day. St. Thomas Church, in particular, was one of Ernest Skinner’s favorite and most celebrated organs. For many years the Skinner company had an office and showroom across Fifth Avenue and Skinner and his friend T. Tertius Noble often entertained customers using the St. Thomas organ as a demonstration instrument. Harrison saw his new organ at St. Thomas to be his response to the verbal abuse which Skinner had dished out through the years, to which Harrison had never replied in print. For all of these reasons, the mystique surrounding Harrison’s death and his role as the figurehead of Aeolian-Skinner has been perpetuated, even to this day, quite apart from the organs he wrought. Inevitably, Harrison’s death paved the way for Roy Perry to gain further prominence as he placed his own personal stamp on the body of work for which he was responsible. Upon Harrison’s death Joseph S. Whiteford was immediately appointed tonal director and chairman of the board of Aeolian-Skinner, so there was no crisis of leadership within the company, except for the fact that Whiteford was young, rich, and was seen by many of the older company employees (many of whom had been with the company for many years) as something of a Johnny-come-lately on the scene. The work that came out of the factory at this time was of uniform quality, but varied greatly in their final tonal attributes, depending upon the local installation crew and finisher. This was particularly so in the case of the large four-manual organ in the new St. Mark’s Church (now Cathedral) in Shreveport, Louisiana, where Roy and the Williams took it upon themselves to make significant changes on the job. William Teague said in his talk at the 2011 East Texas Festival that Whiteford quipped, not entirely in jest, “it’s a Perry organ, not a Whiteford organ.” Nora Williams, in her interview referenced above, likewise tells of serious disagreements between Roy and Donald Gillett, Whiteford’s successor several years later. Roy, for his part, however, always gave credit to both men and their gifts and, while not afraid to offer suggestions and criticism boldly, he yielded to their authority, at least in principle. Apart from the Kilgore and Longview organs, Roy Perry’s most compelling work was undertaken in the post-Harrison years of Aeolian-Skinner: Church of the Heavenly Rest, Abilene, Texas; Caruth Auditorium of Southern Methodist University (now in Saint Luke’s Church in Dallas); Temple Emanu-El, Dallas; First United Methodist Church in Houston; St. Mark’s, Beaumont, Texas; First Presbyterian Church (now Trinity-First Presbyterian), Laurel, Mississippi; and First Baptist Church, Chattanooga, Tennessee; and, of course, the Shreveport organ. Occasionally his work took him outside of his normal territory and it is known that he worked on company jobs at Asylum Hill Congregational Church in Hartford, and Trinity Church in Upperville, Virginia. 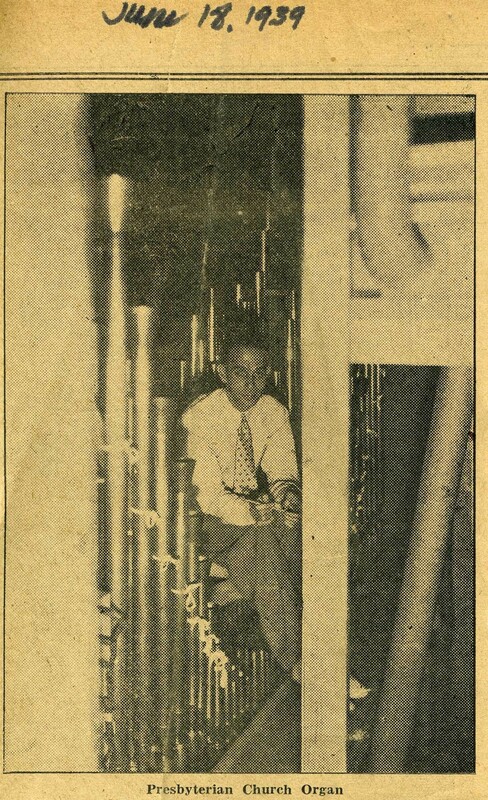 In Kilgore he made some additions to the organ in First Presbyterian Church in 1966, notably the low 12 pipes of the 32′ Bombarde, his personal memorial to G. Donald Harrison. Also the exposed pipework flanking the chancel window and Trompette-en-Chamade, consisting of a mounted cornet with separate draws for the 8′ and 2′ ranks, and a third mixture in the Great division called Plein Jeu, which was designed to cap the full organ with sound from the flue chorus, contrasting to the Trompette-en-Chamade in the reed chorus. This was one of his signature goals when he could accomplish it in larger organs: the choruses of either the reeds or the flues/mixtures could dominate the organ as desired, or they could each contribute to a thrilling full organ sound. He also added a high pitched tierce mixture in the Swell which he called Carillon, for use as a special effect, particularly in episodic contrapuntal music. He also added in the Choir division a new and unusual celeste stop of tapered harmonic flutes called Harmonic Spitzflöte II. At this time the console was updated with drawknobs and a new combination action, but still within the original Möller console. These additions were made possible through the contributions of the Crim family who had given and enhanced the organ from its humble beginnings to this point. The Crim’s had also given the chancel window when the church was built in 1939 which, together with the Trompette-en-Chamde, became an icon in the printed literature of both Aeolian-Skinner and of the church. Frederick Swann and Roy Perry, 1966. In 1967 Roy was feted on his 35th anniversary as Organist and Choirmaster of the First Presbyterian Church, including a recital by Frederick Swann, a testimonial dinner with gifts, and a commemorative plaque in the chancel presented by the Aeolian-Skinner company. In retrospect, for want of a story with a happy ending, once could wish that he had retired then at the top of his game, but he was only 61 years old. RP with the Rev. Dr. Shirley C. Guthrie, pastor of the First Presbyterian Church, at his 35th anniversary celebration. The demise of the Aeolian-Skinner Organ Company may have caused Roy and the Williams some sentimental angst, but they probably had seen the handwriting on the wall; by this time they had built several organs on their own. Aeolian-Skinner’s fortunes had been hanging in the balance for some years. One can cite with reasonable accuracy and authority a combination of factors for the company’s inexorable fall from its once dominant place in the organ building field, including post-World War II inflation, the death of Harrison, growing interest in historical organs (for example, the Organ Historical Society was founded in 1956), and careless business practices. One of the ideas tossed about, with some seriousness, in Aeolian-Skinner’s end game was a plan hatched by none other than Martin Wick, president of the Wicks Organ Company. It was Wick’s idea to buy Aeolian-Skinner and bring it to Longview, Texas, with Roy Perry as the tonal director. Martin said he had no trouble with the idea of building Cadillacs in one factory and Chevrolets in another! But, if I remember the story correctly as Roy told me, Wick couldn’t get his board of directors to agree with him. However, Roy’s unhappy separation from the church in 1972 was a devastating personal trauma which, in varying degrees, caused him pain for the rest of his life. Like so many talented workers in the church with unusually long tenures, the very attributes that contribute to an effectiveness over a long period of time, became, in a fairly short period of time, a negative force in the climate of inevitable change. The precise series of events leading to this denouement may never be known and are really irrelevant in terms of Roy’s legacy, except to complete the poignant narrative. A talented novelist could, in all likelihood, have taken the cast of characters and circumstances as given at this confluence of events in post-oil boom, small town Kilgore, and made a compelling page turner fit for night time television without altering any of the facts. For a detailed account of Perry’s work at Washington Cathedral, see Roy Perry, Paul Callaway, and the Washington Cathedral Organ | Neal Campbell–Words and Pictures. I met Roy Perry in June 1972 when I was a finalist at the National Organ Playing Competition held in conjunction with the AGO national convention held that year in Dallas. 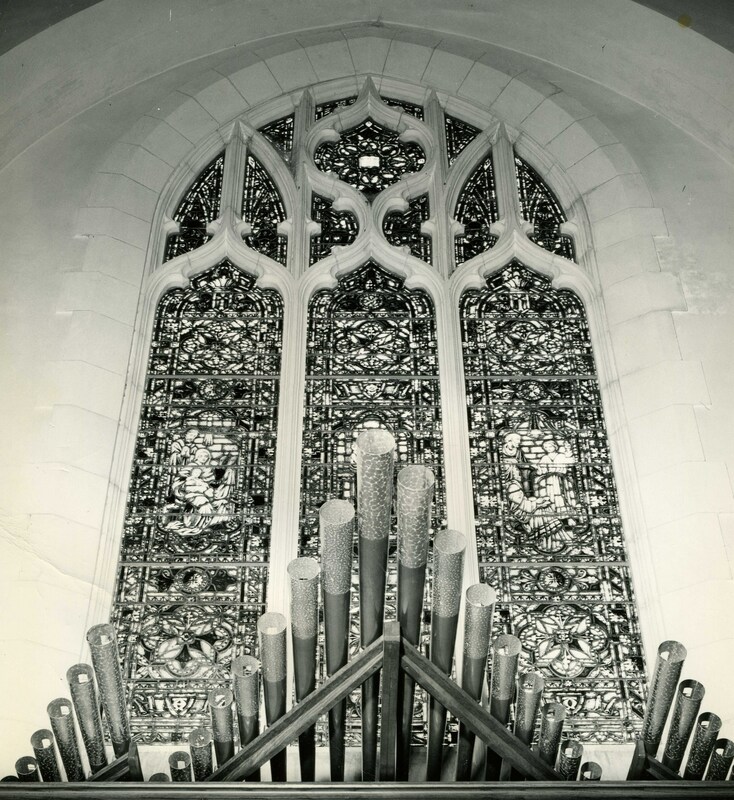 My teacher was William Watkins, and he wanted me to meet Roy and to see the organ in the First Presbyterian Church, which was his favorite and on which he had played and recorded shortly after its installation. At the time I did not know of the impending talks with Washington Cathedral, but when I did learn that Roy would be coming to the city where I lived, worked, and studied, his trips were given priority in my calendar, and I cleared the way to meet him at the airport, run errands for him, and introduce him to my friends and invite him to come to some of my services. I also had many opportunities to sit in silence as he and Aeolian-Skinner’s former head voicer John Hendricksen went through the painstakingly patient process of finishing the many ranks of new pipework for the cathedral organ. I also had the opportunity to visit a few of his friends who made their way to Washington to see him and his work at the cathedral, including Joseph Bramlette for whom Roy and Jim Williams had just completed a house organ in Malibu, California. 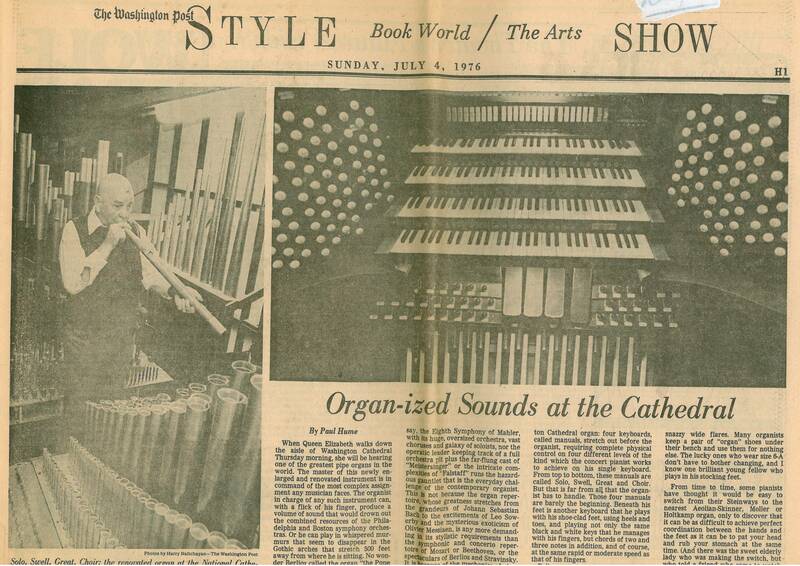 Roy Perry and the cathedral organ on the first page of the Style section of The Washington Post, July 4, 1976. I left Washington in 1976 just as the work at the Cathedral was complete. By this time Roy had made something of a name for himself as a consultant and potential organ designer, and various offers and inquiries came his way, both in Washington and beyond. His last work was designing and finishing some additions to the Aeolian-Skinner organ in the Church of the Epiphany in downtown Washington, where my good friend Charles Callahan was then the organist. I kept in touch with Roy via telephone and letters, and through Charlie, who had the occasion to see him frequently. Increasingly the reports of his health were not good, his various afflictions worsened, complications from diabetes escalated, and his behavior became more erratic, approaching that of dementia. I was soon to see for myself something of the nature of this disturbing series of events. Undeterred, however, I had arranged for him to survey the Aeolian-Skinner organ in St. George’s-by-the-River Episcopal Church in Rumson, New Jersey, where I was organist. The organ, while very effective, had never been completed and it was my thought that Roy and his cathedral consortium, which he humorously referred to as Organbuilders Anonymous, might complete the organ. I forget the exact sequence of crossed signals surrounding his visit, except that I had been given the flight number for his plane which was to arrive at Newark Airport. When I arrived at the gate I was told that the flight number he had quoted me was for a flight to LaGuardia Airport in New York. This being the days before cell phones or hand-held email devices to confirm such details, I simply got in my rickety Volkswagen and drove from EWR through the Holland Tunnel, through Manhattan, and out to LGA. No Roy on any flight there, either. So I called the secretary at St. George’s saying I had been delayed, only to be told that a Mr. Perry was waiting for me in the chancel of the church. His flight did arrive in Newark, but was indeed assigned a different number from that which he quoted me. So, back home I went, across the Verrazano Narrows Bridge, through Staten Island, the Outerbridge Crossing, down the Garden State Parkway, to the church, now several hours later than I had planned, where—sure enough—he was at the organ. That was enough of a snag for one day, but I only learned later, from various sources, what had actually transpired during the morning while I was driving all over Monmouth and Essex counties in New Jersey, and the boroughs of Manhattan, Queens, and Staten Island. When I didn’t show at EWR, Roy had confidently hailed a limousine for the only good-sized hotel near Rumson anyone could find for him, the Molly Pitcher Inn in Red Bank. When he got there, he inquired for a room, but they told him they had nothing. He pressed a little, invoked the name of St. George’s-by-the-River, said he was only there on business for the night, so they gave him an unused staff room—fine. He got to his room, unpacked, called the church leaving a message for me when I called in, and decided to freshen up. So, he undressed and got in the shower—no soap. Traveling light, he didn’t have a robe, but he did have a Washington Cathedral stone carver’s apron in long gray canvass with the Cathedral’s iconic Jerusalem cross embroidered in episcopal purple on the front which a stone carver from the Cathedral had given him. Foolishly (but this was Roy!) he slipped it on, and went out into the hall to find some soap and some slightly disoriented, non-English speaking women saw him naked from the back and shrieked in horror. God only knows what he said to her, but the house security detail forced him to leave the premises immediately. As he strode indignantly through the lobby with his belongings to find a cab to the church, he yelled at the top of his voice to no one in particular, thinking he was quoting the namesake of the hotel, Molly Pitcher, “shoot this old gray head if you must, but spare our country’s flag, she said.” To which some mousey anonymous tourist sitting on a suitcase said, “wasn’t Molly Pitcher said that, it was Barbara Fritchie!” Exeunt omnes! It’s a tragic, yet humorously noble scene, and though containing obvious overtones of instability, it still causes me to laugh, even as I write this! Shortly before this time there came to Kilgore a new organist of First Presbyterian Church named Stephen Farrow who reached out to Roy, effecting a time of calm and healing in Roy’s life which in the best of schemes might have evolved into a happy golden era. Sadly, this was not to be as Roy died by his own hand on Saturday, May 27, 1978. Pirtle, Caleb III. Holding Forth The Word of Life: The Legacy of the First Presbyterian Church of Kilgore, 79, 84. Kilgore, Texas: by the church, 2000.